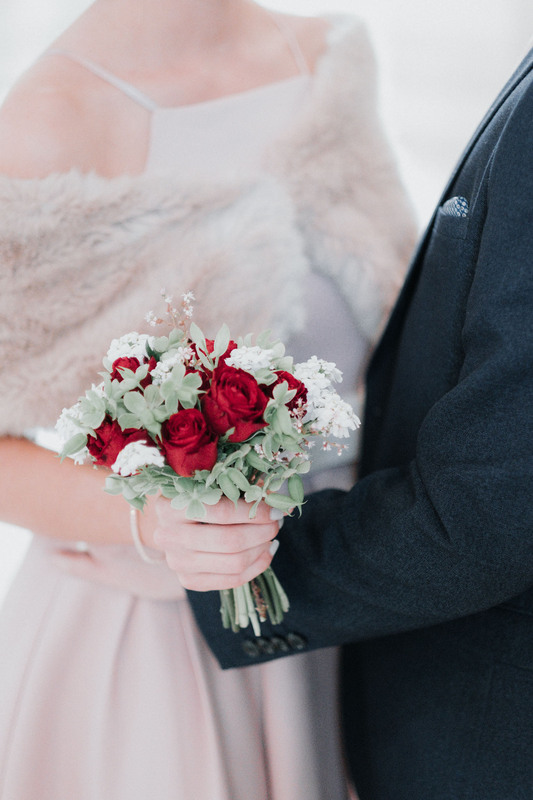 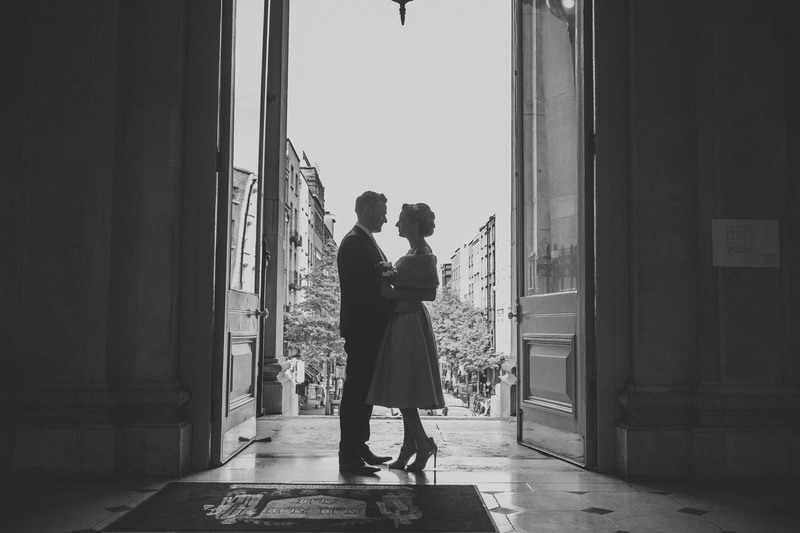 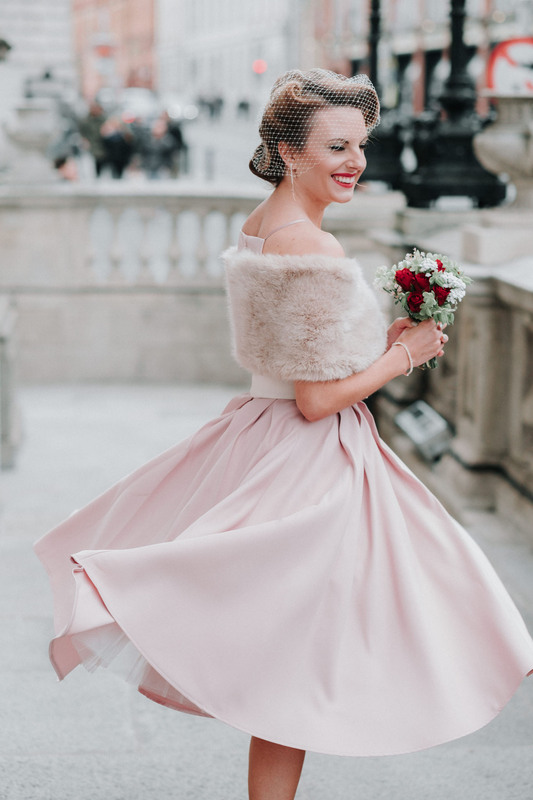 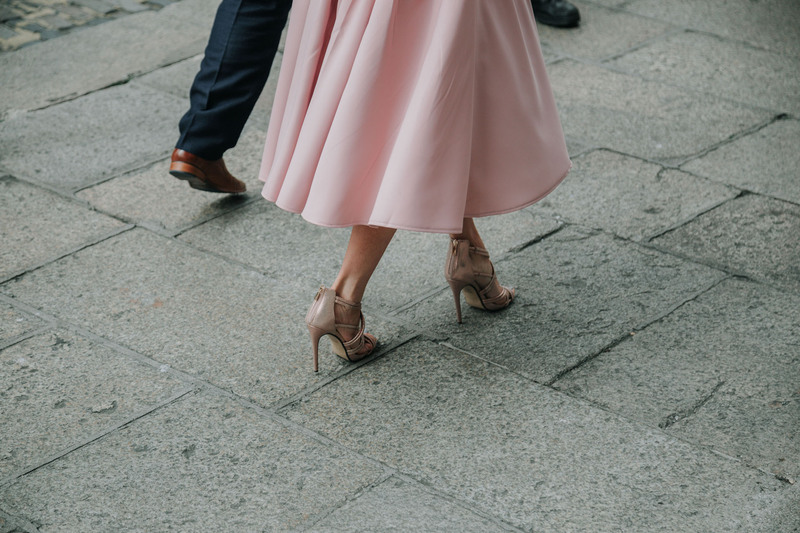 What’s not to love about a city wedding? 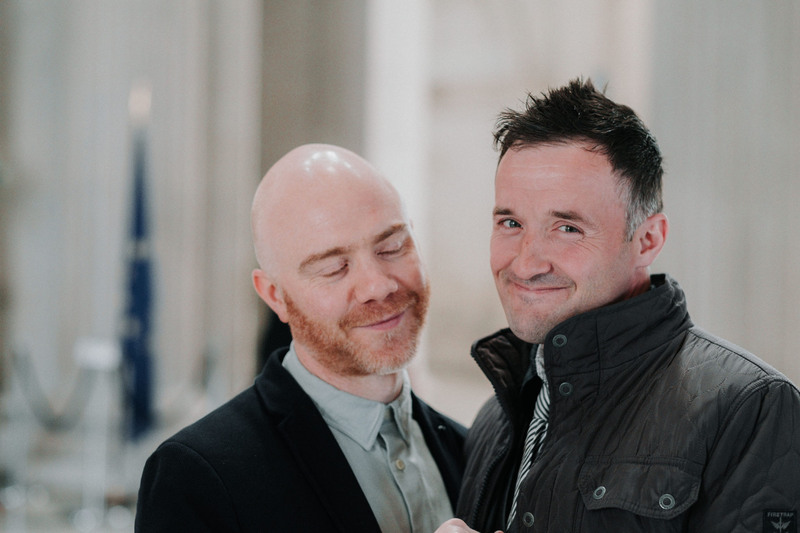 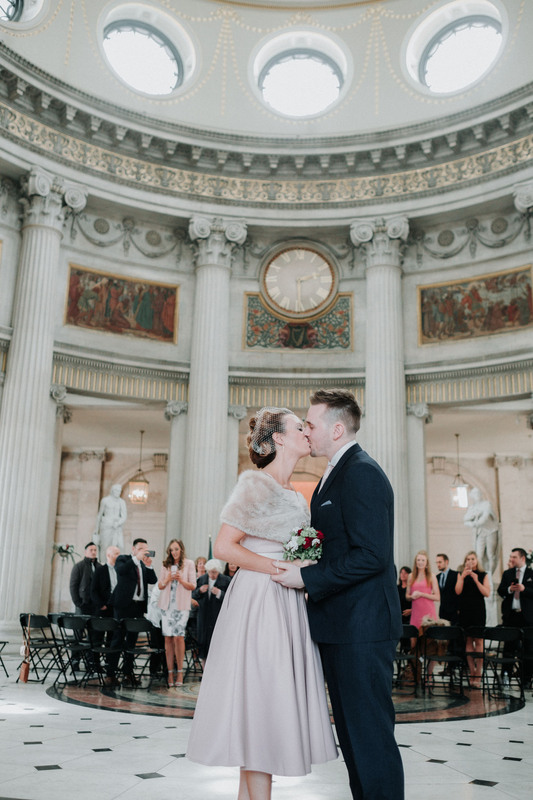 Especially a Dublin City Hall Wedding. 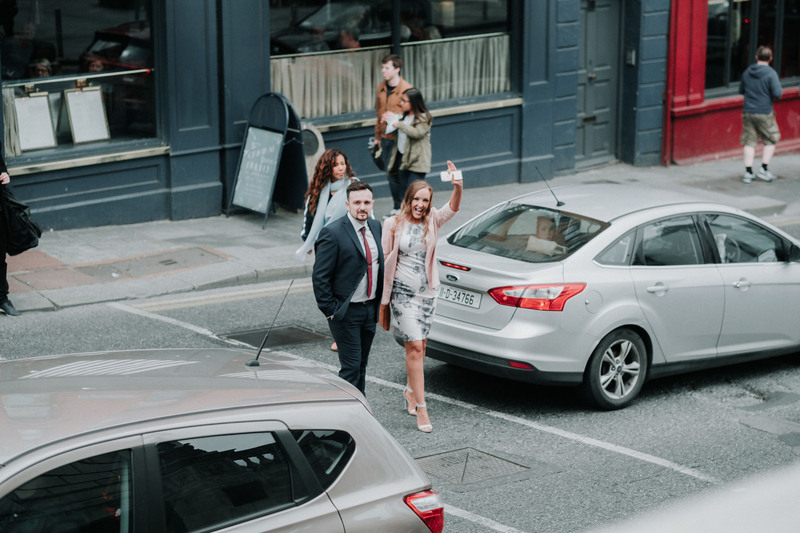 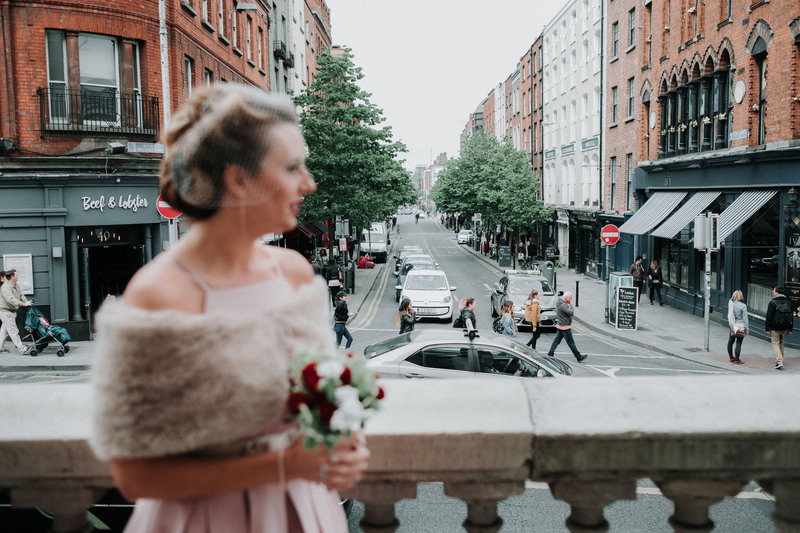 The hustle and bustle of the passing pedestrians and traffic, all slowing down from their busy lives just enough to catch a curious glimpse of the stunning couple Rebecca and Craig on their wedding day. 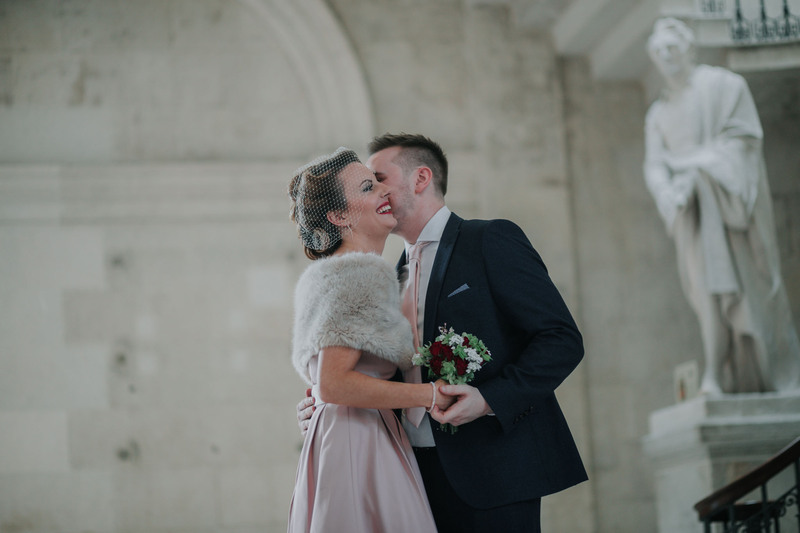 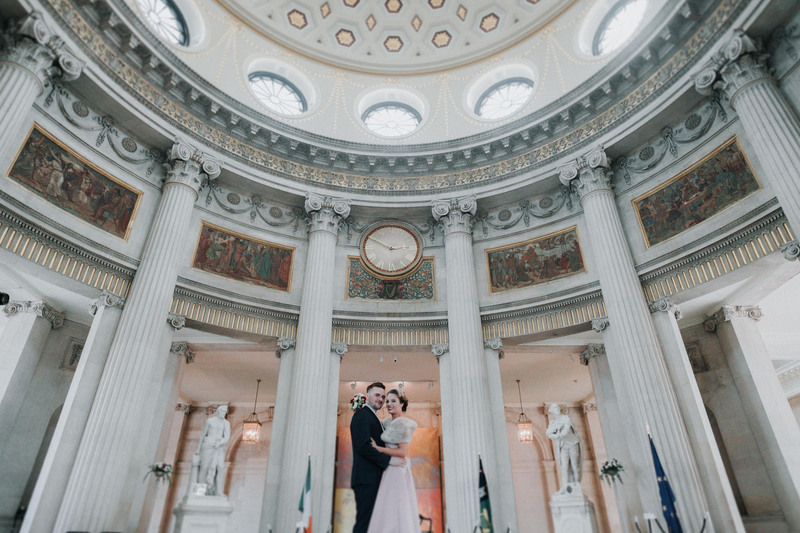 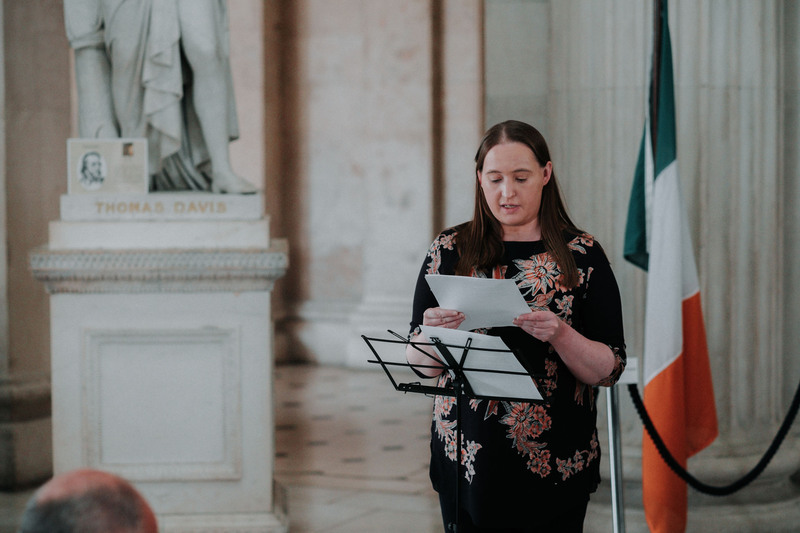 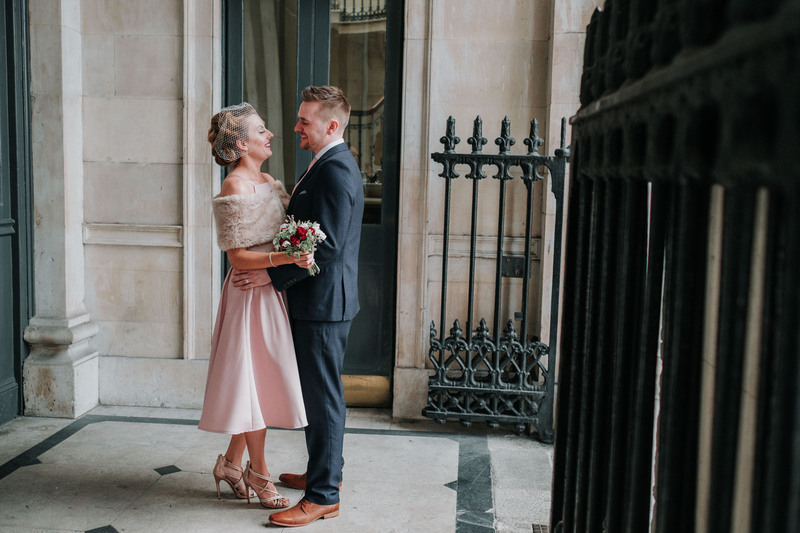 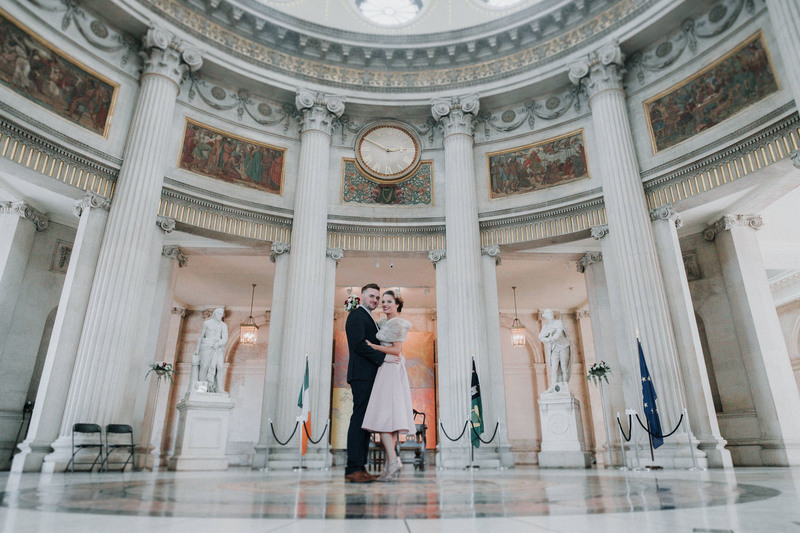 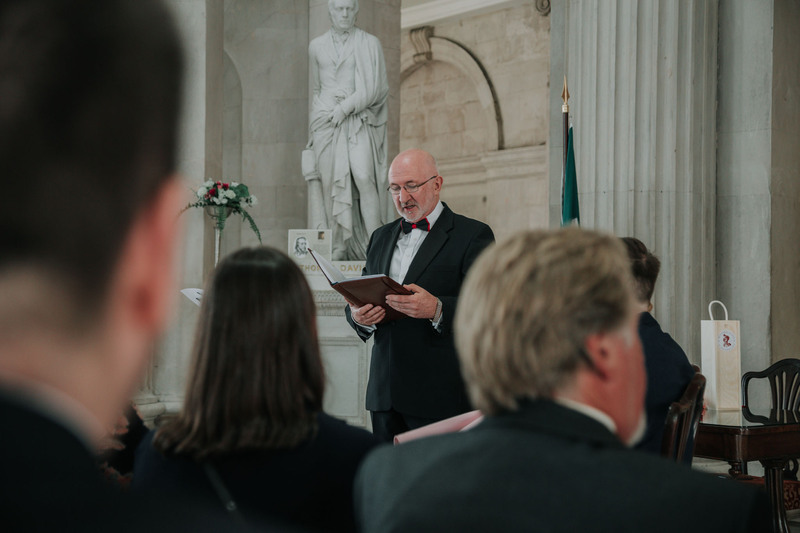 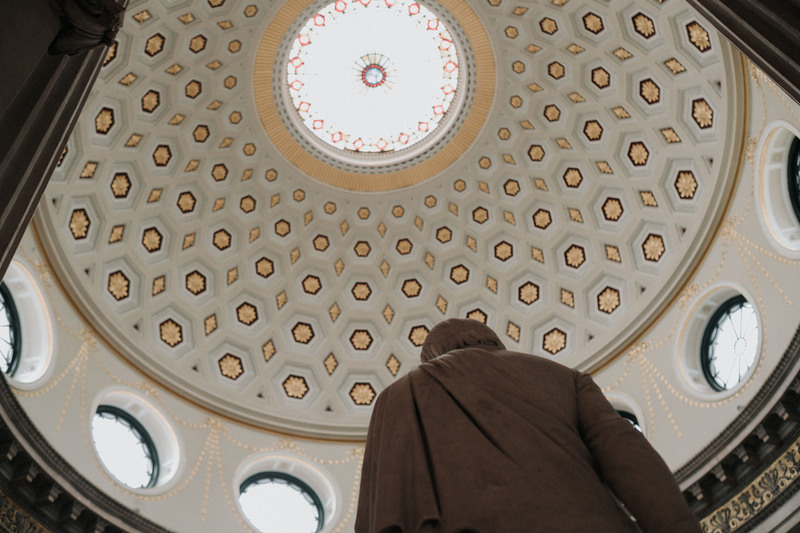 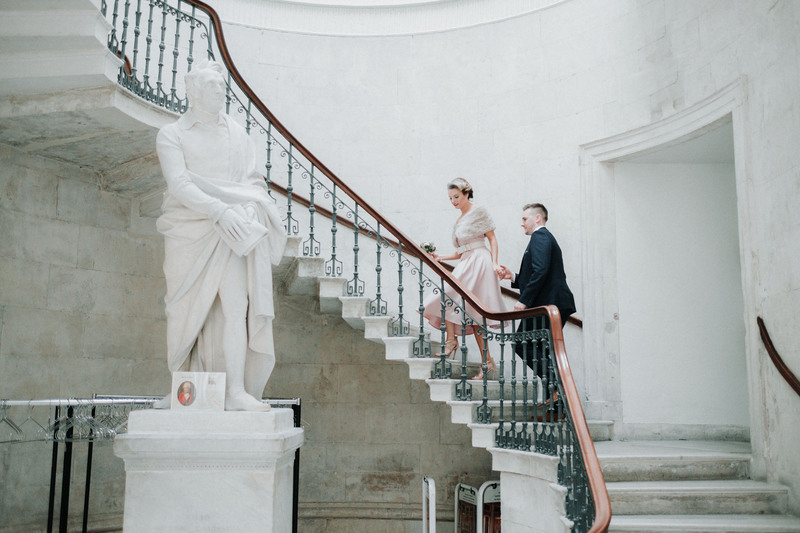 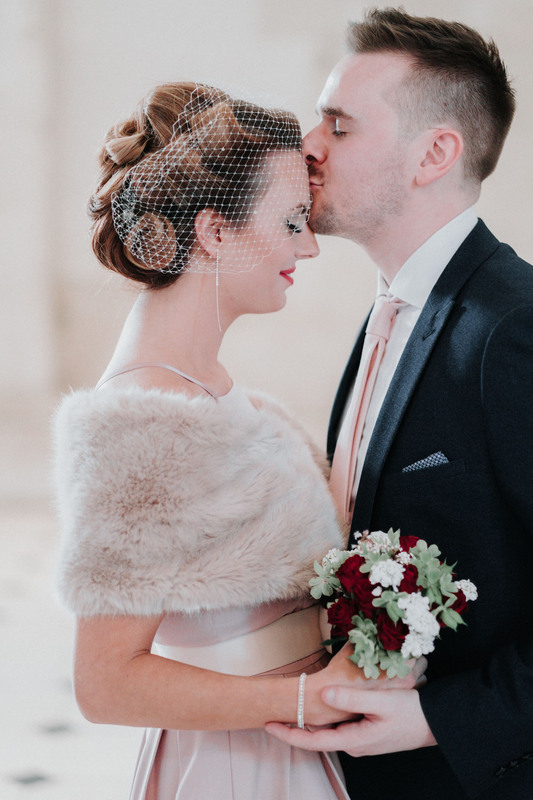 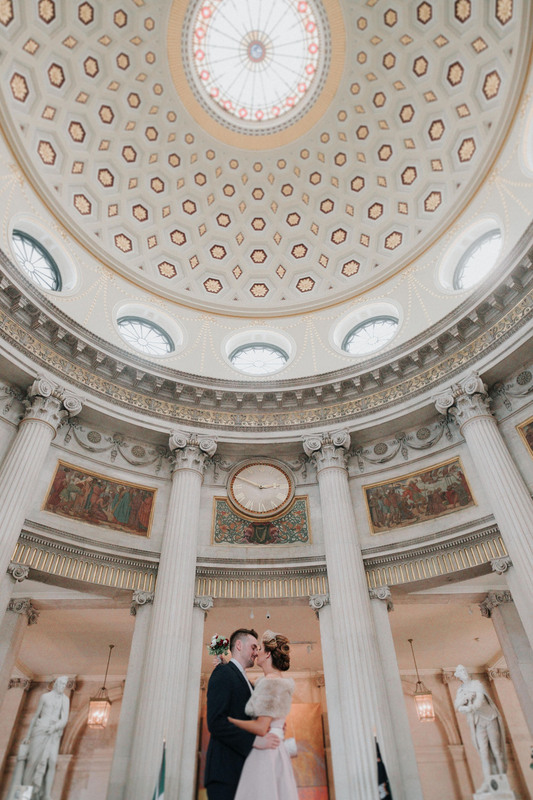 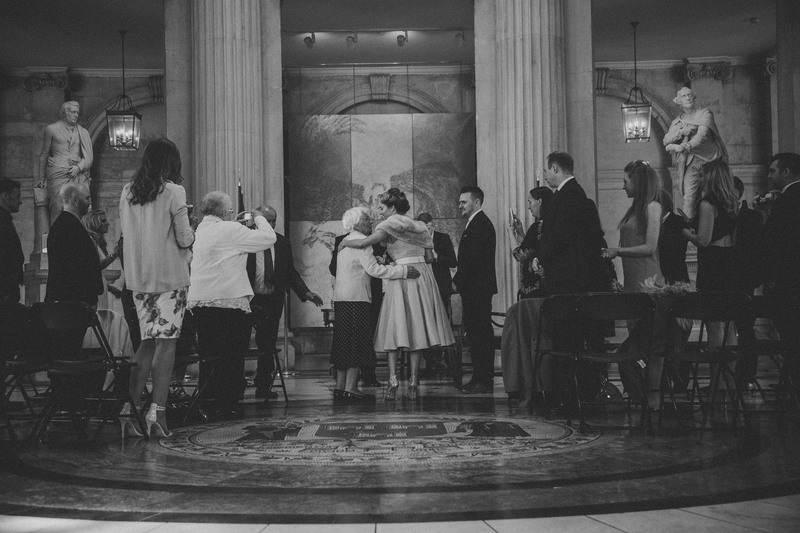 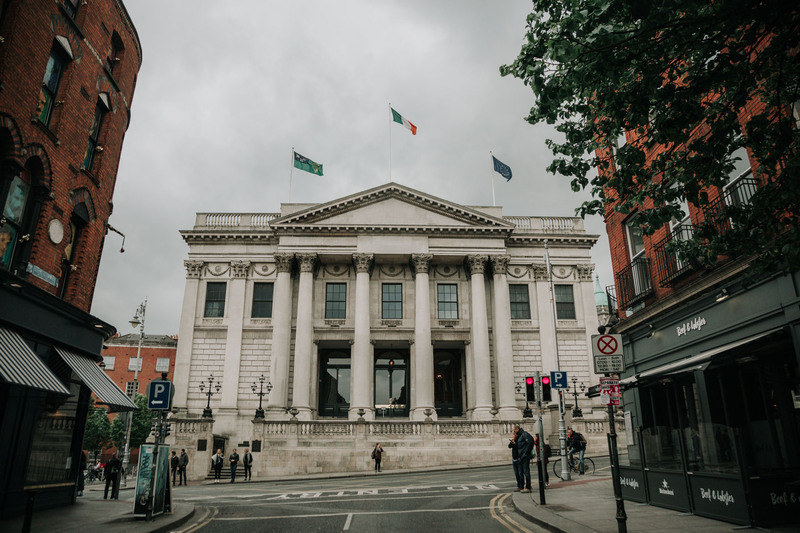 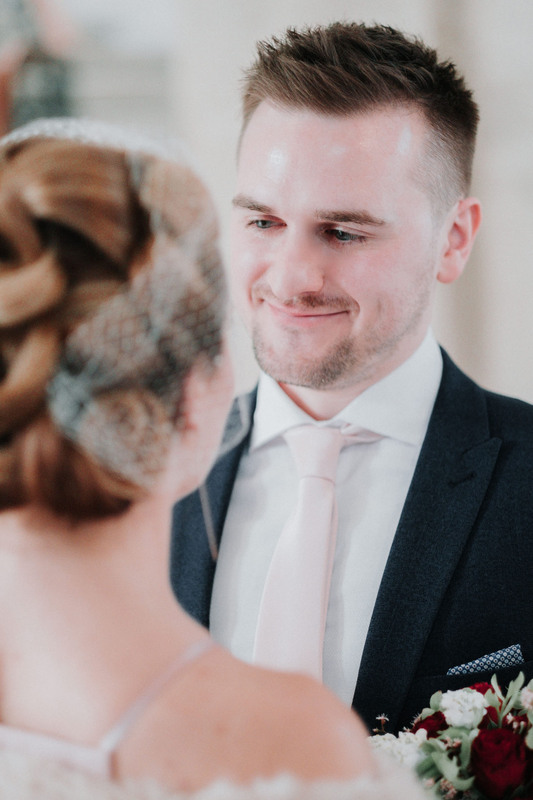 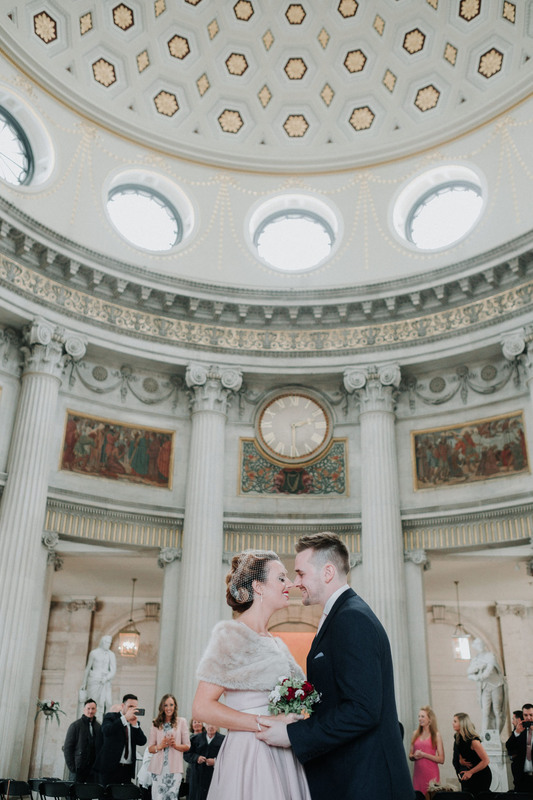 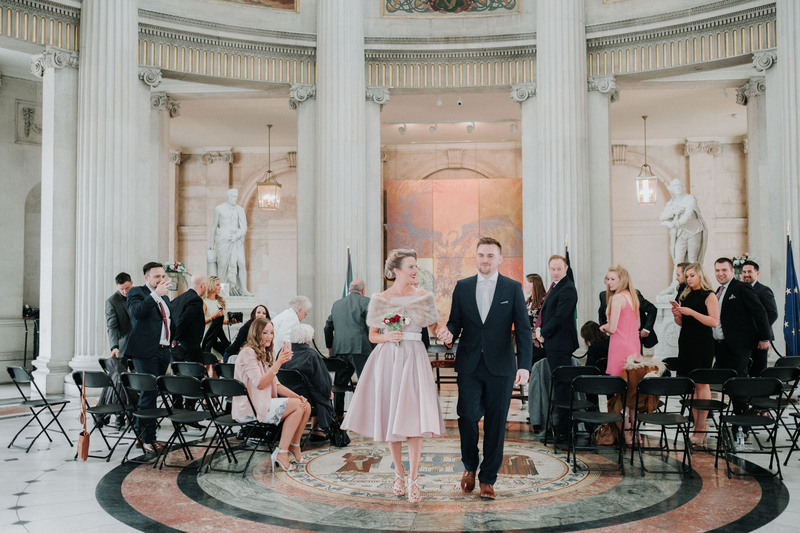 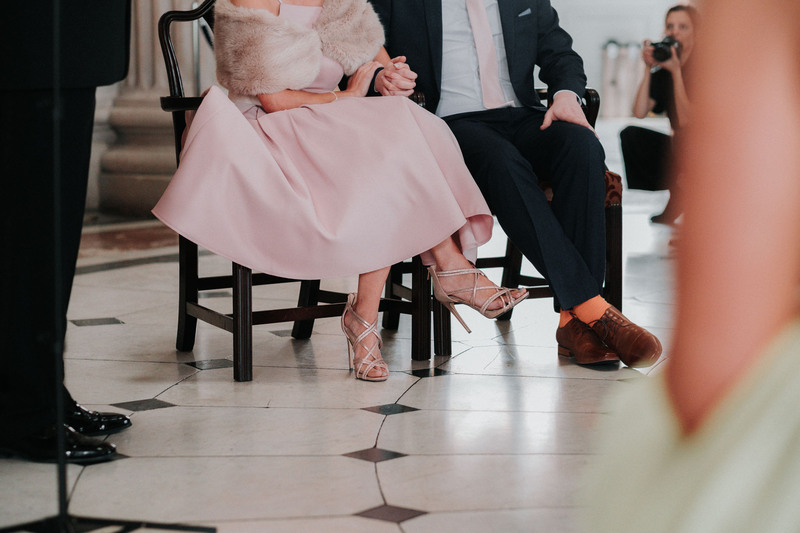 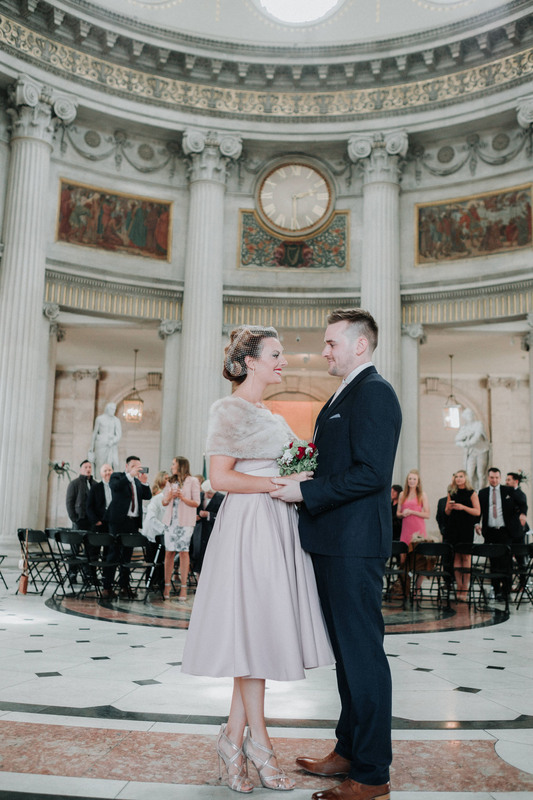 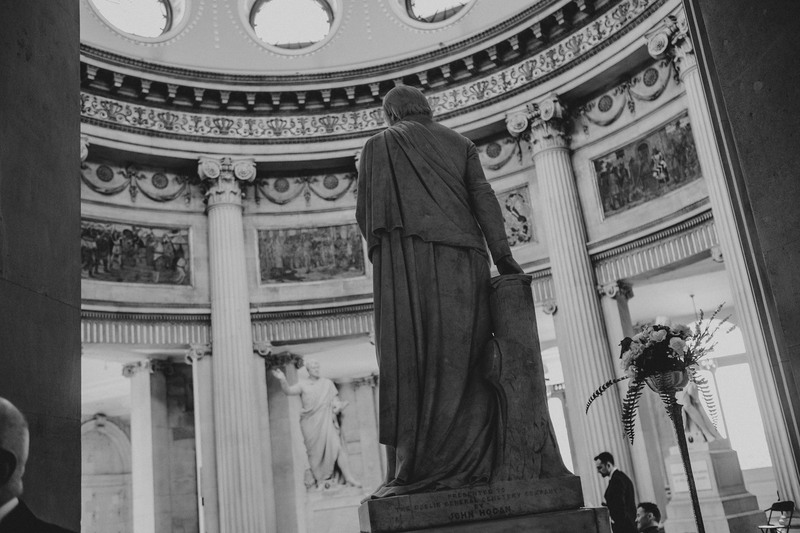 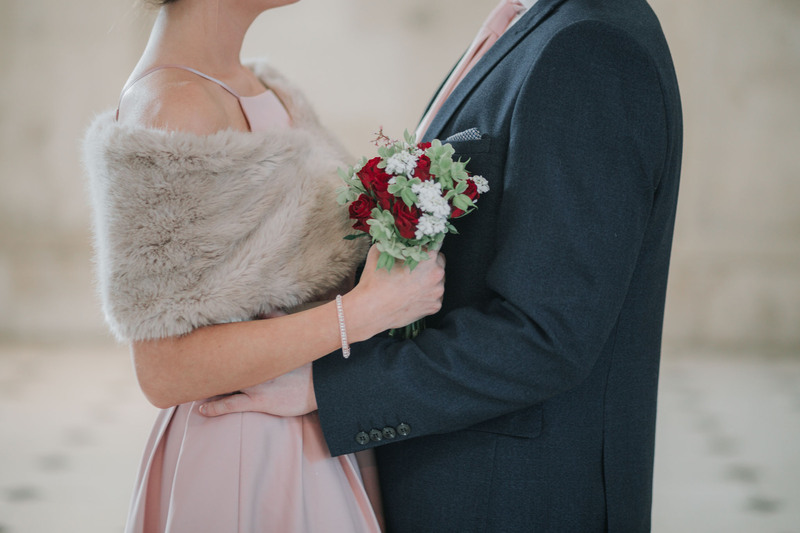 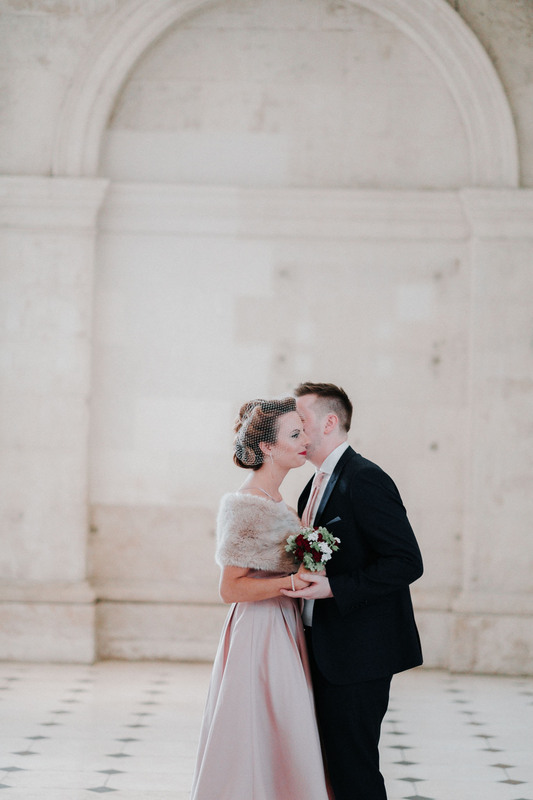 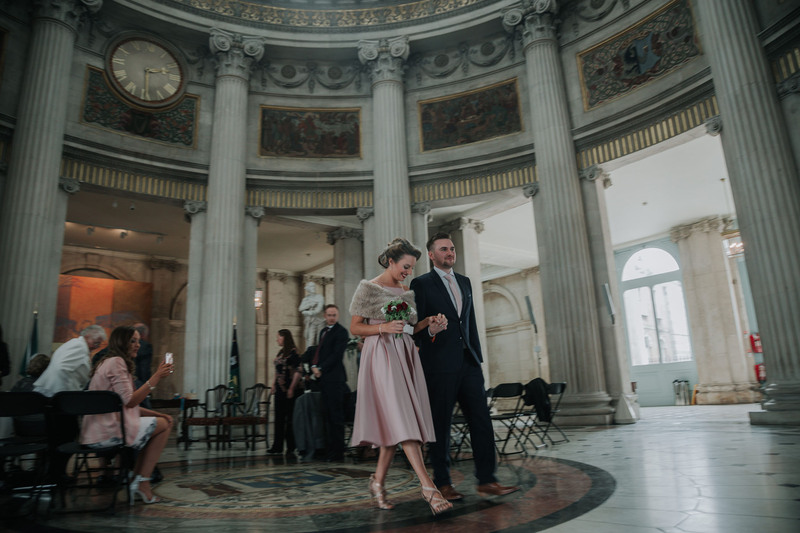 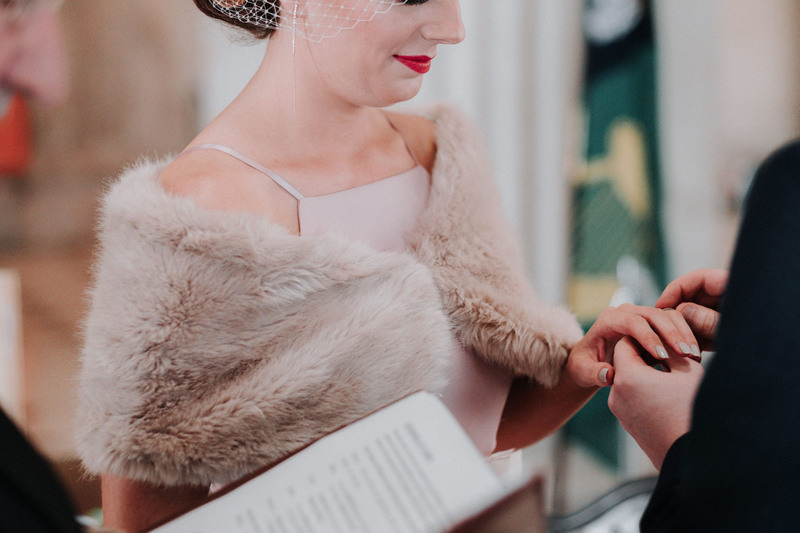 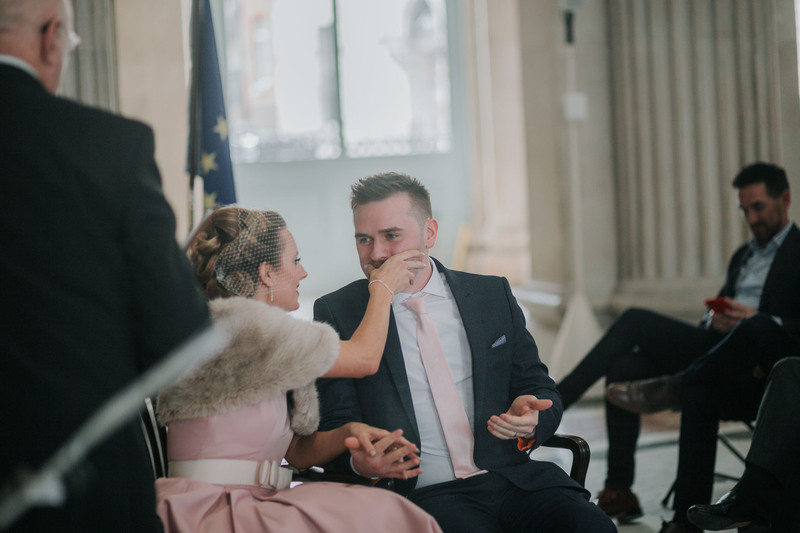 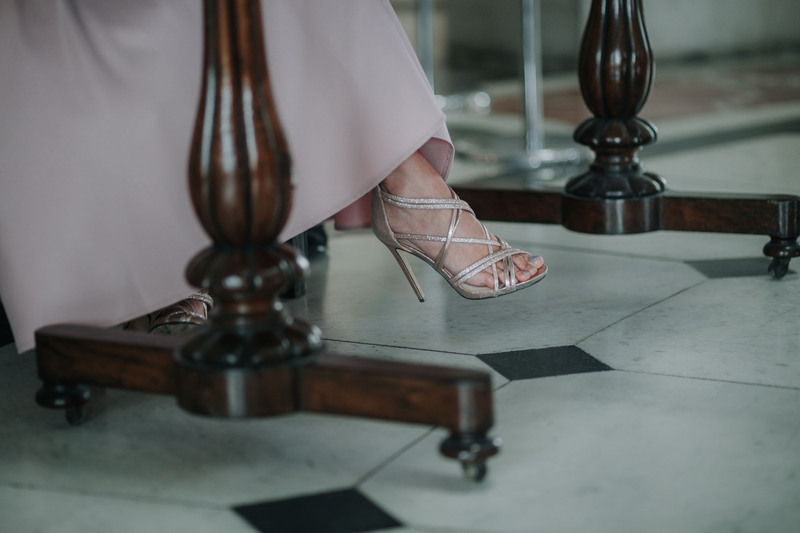 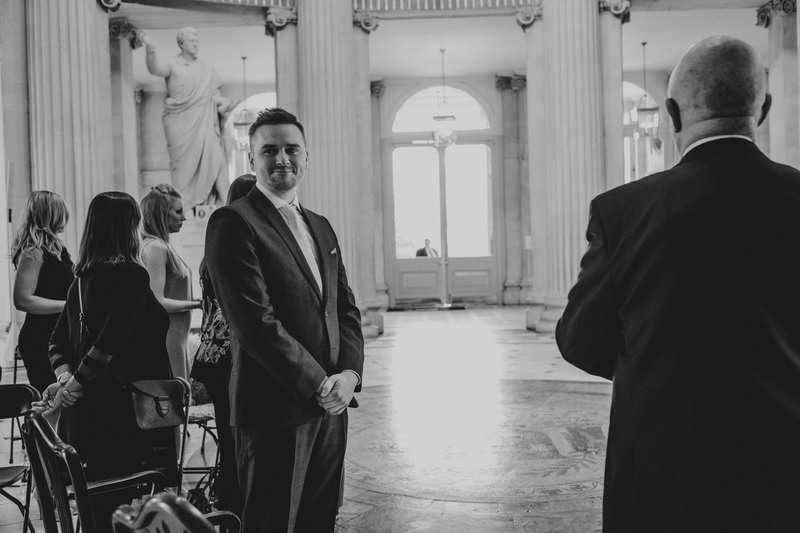 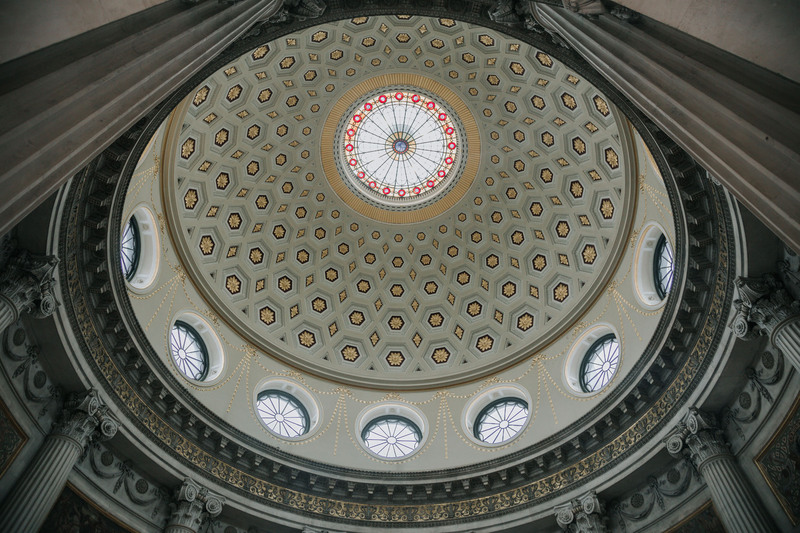 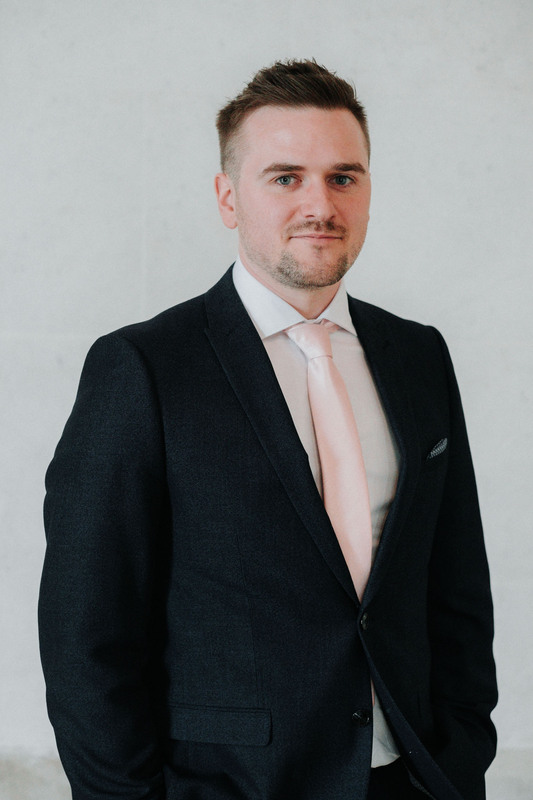 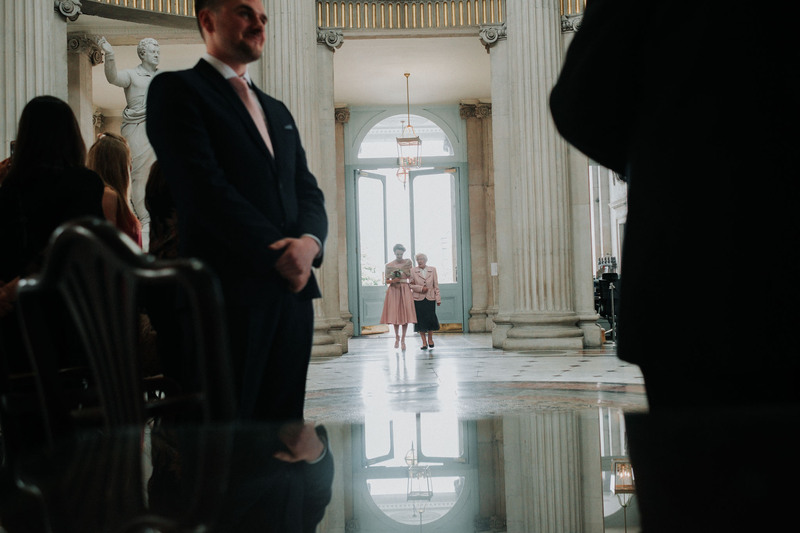 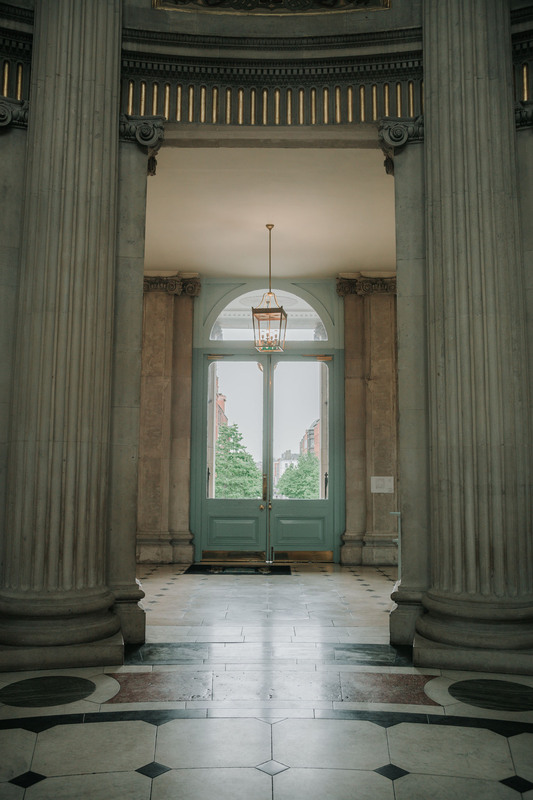 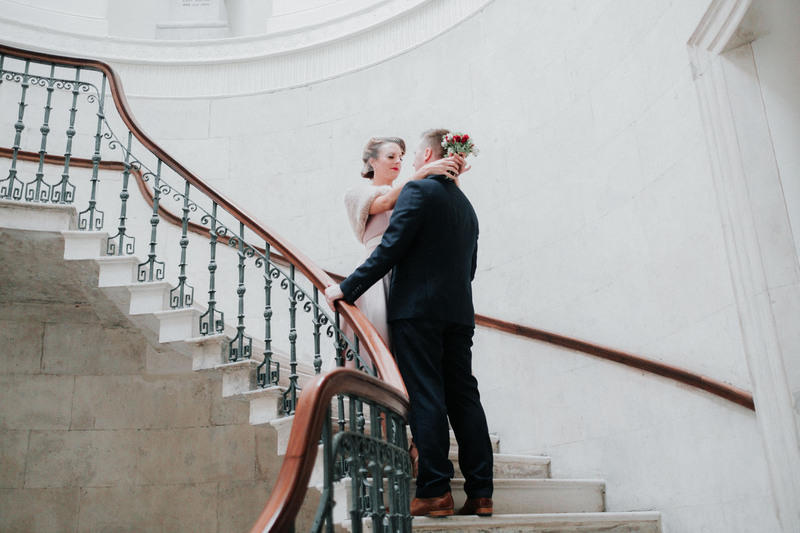 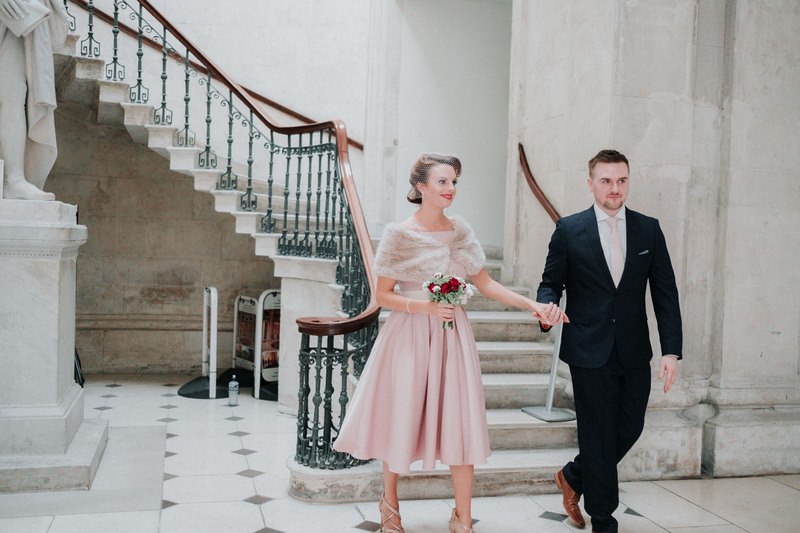 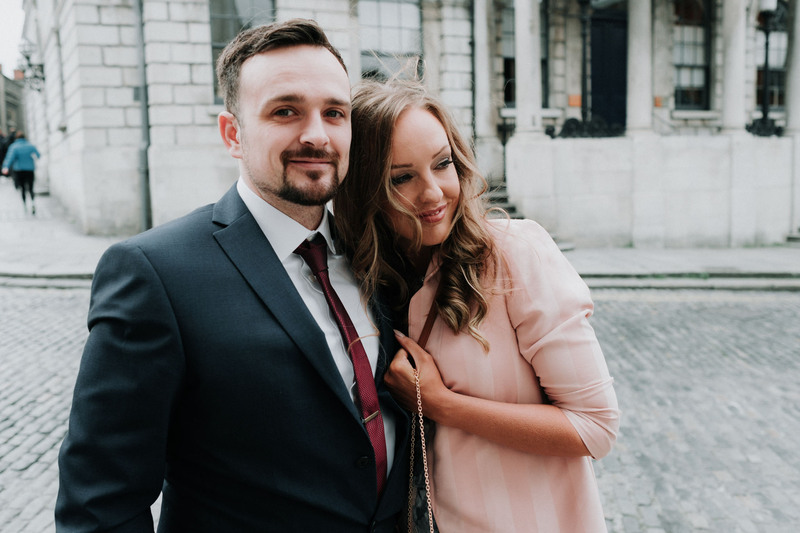 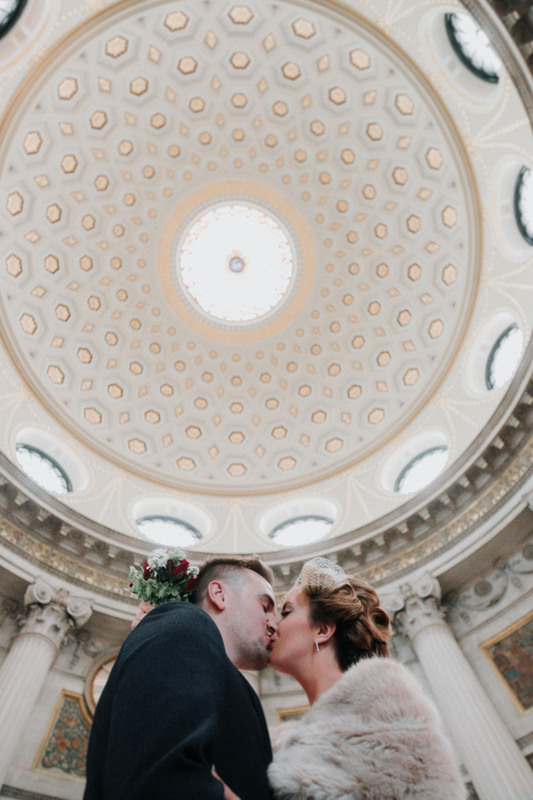 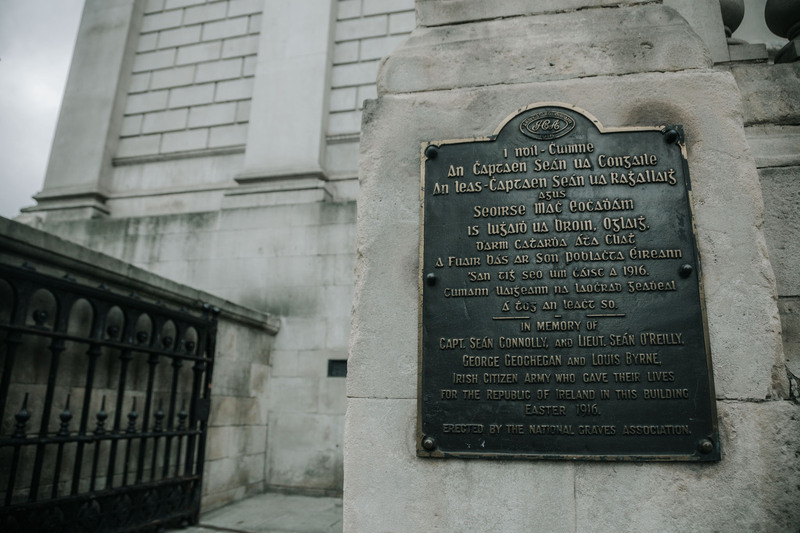 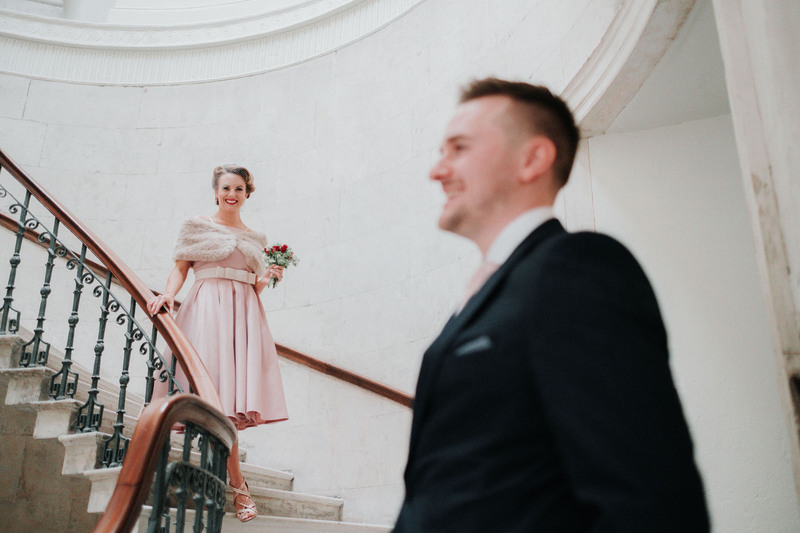 This Dublin City Hall wedding, preceded Rebecca and Craig’s reception which they held four weeks later in sunny Spain, and which I was honored to be able to also photograph. 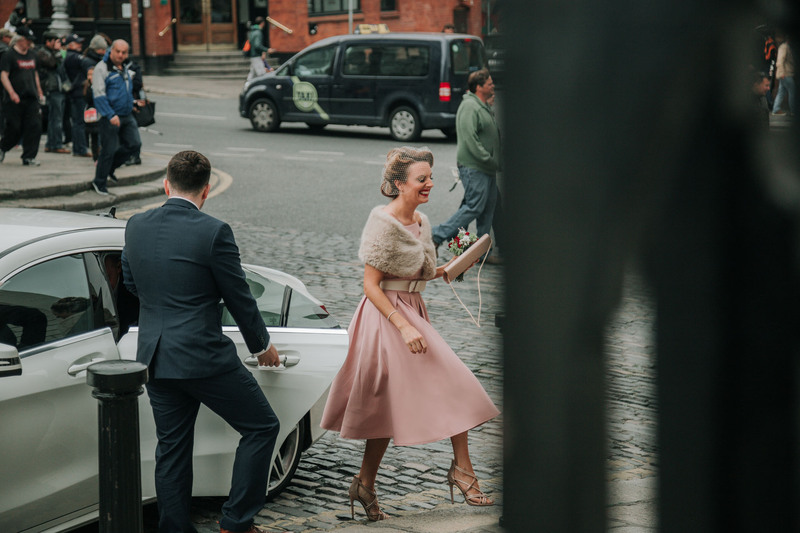 Those fantastic celebrations we’ll be covering in our next blog post so stay tuned. 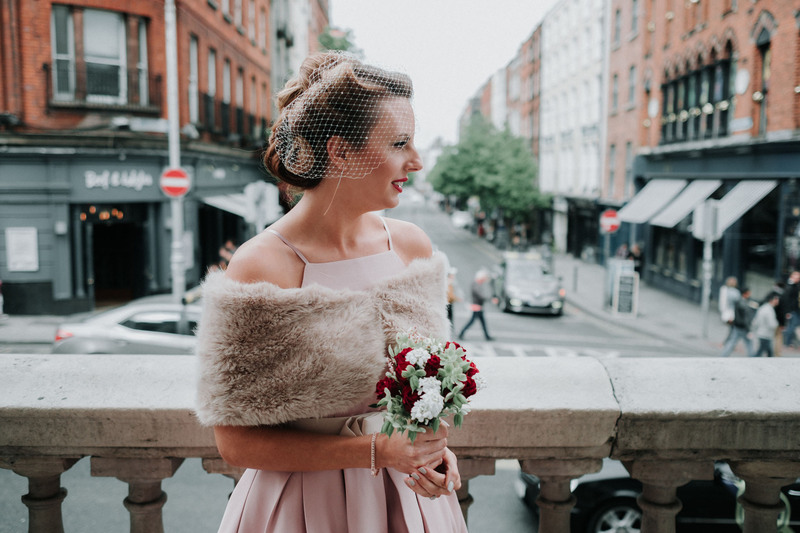 Rebecca made a stunning bride. 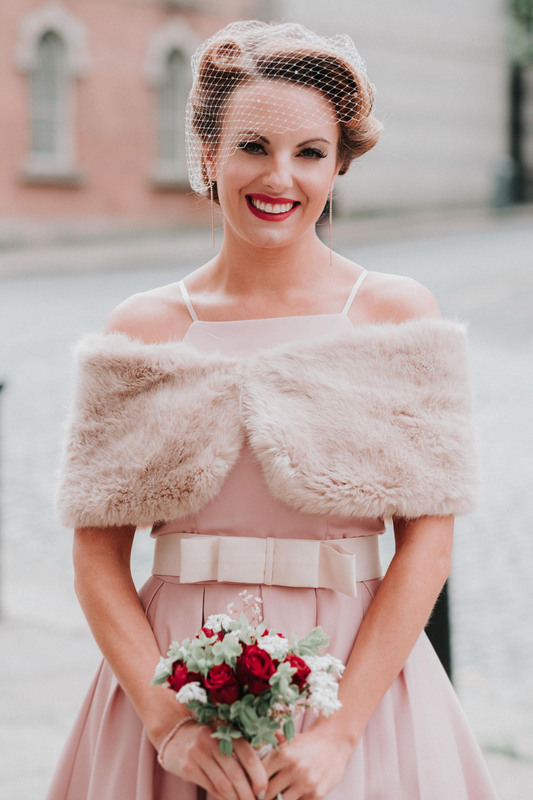 She was uniquely dressed looking picturesque with a touch of vintage fashion. 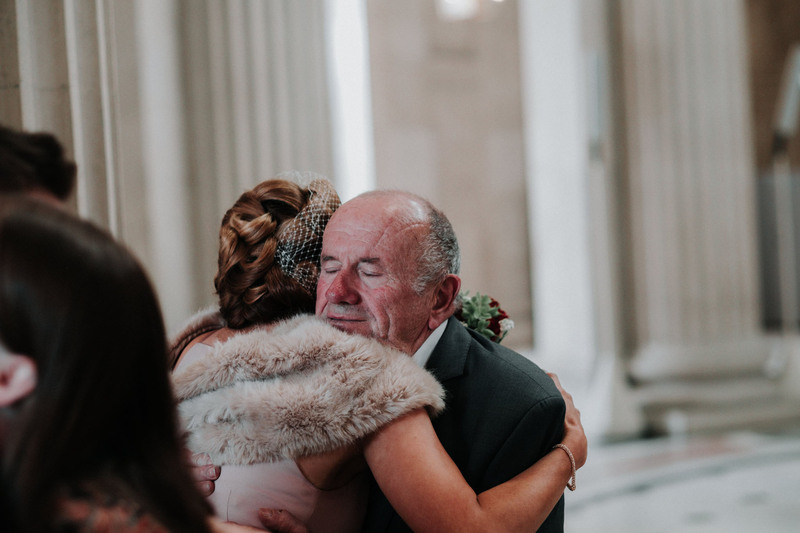 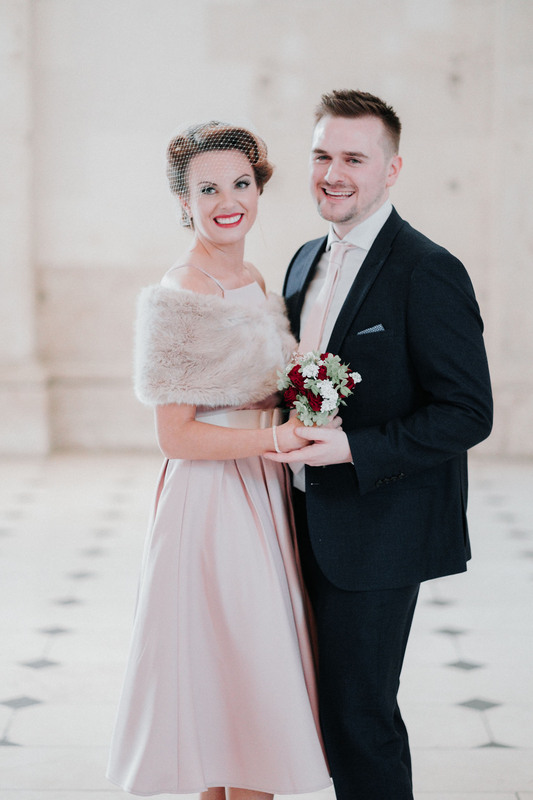 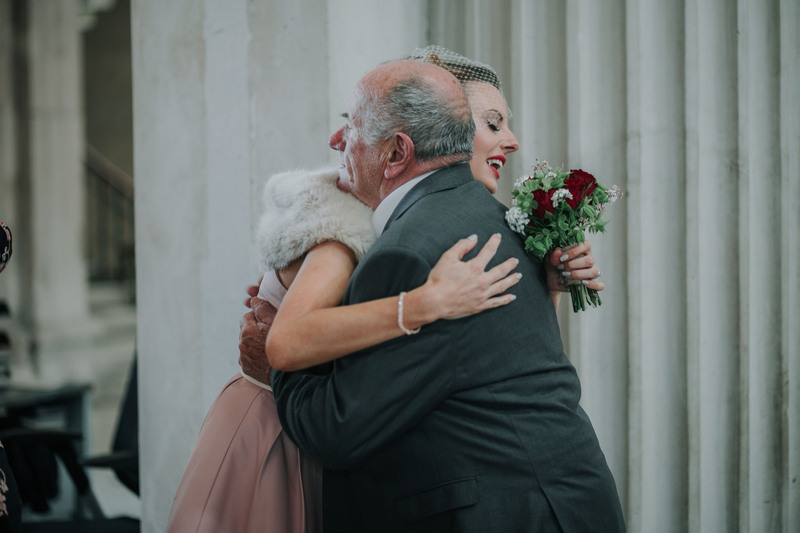 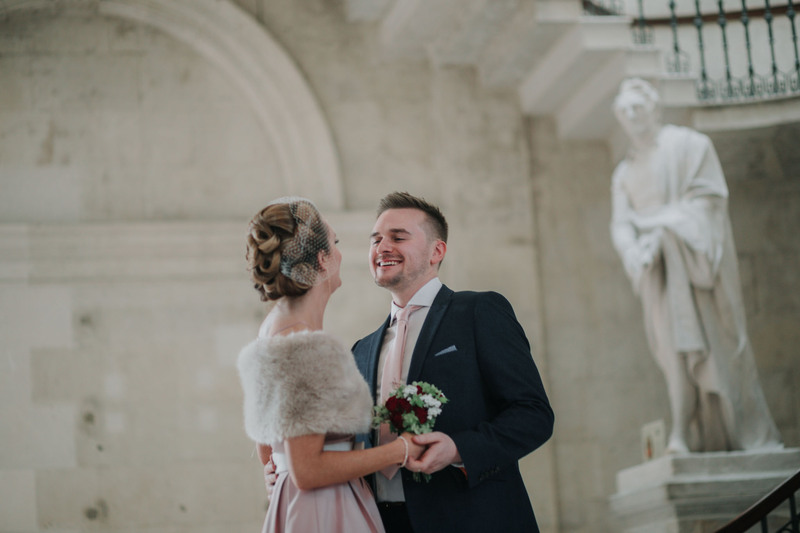 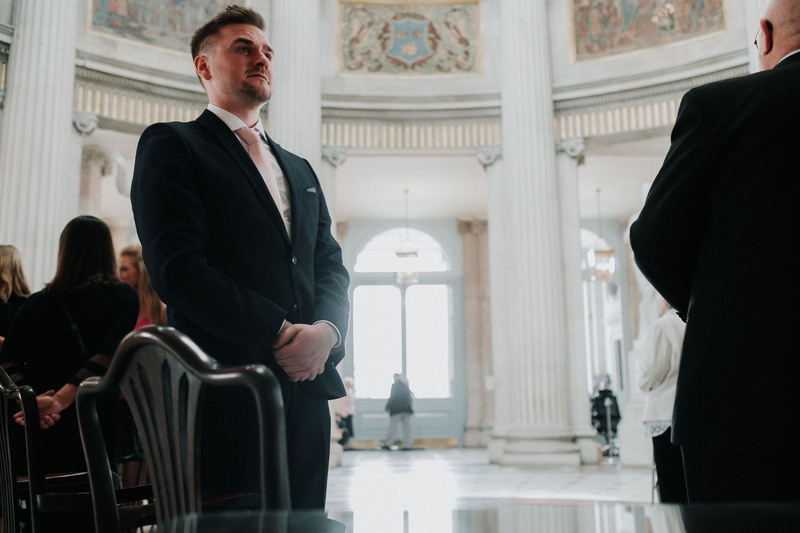 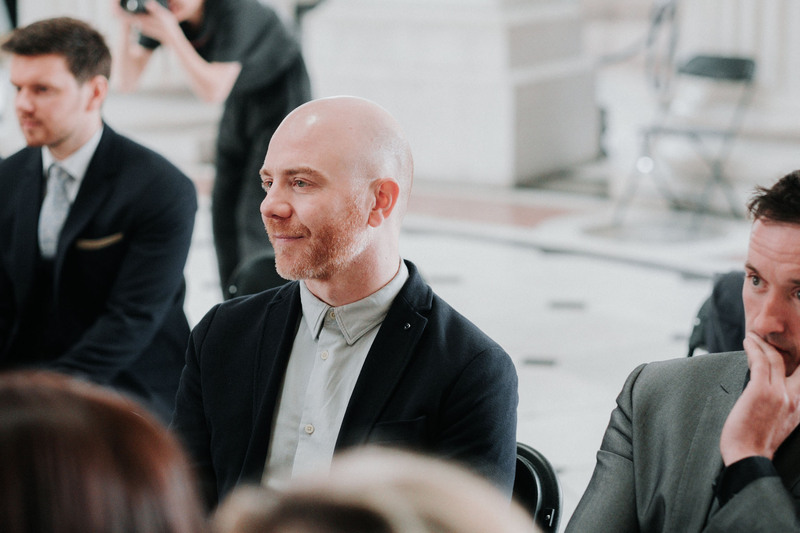 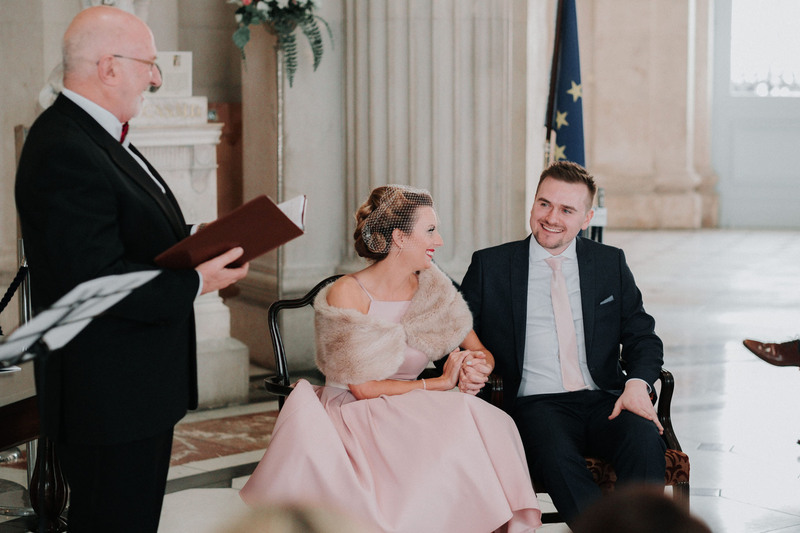 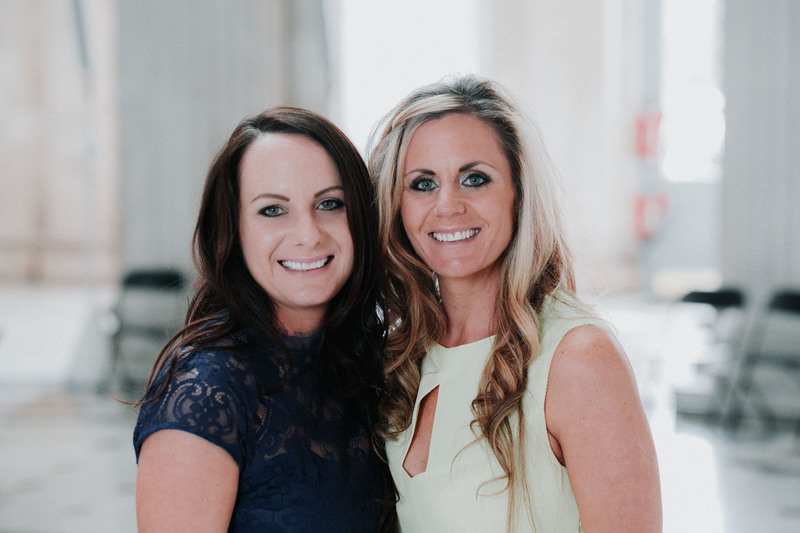 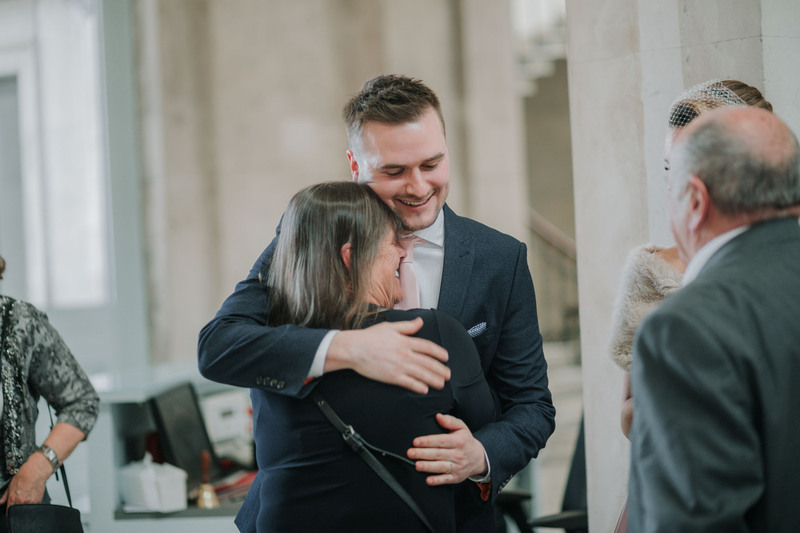 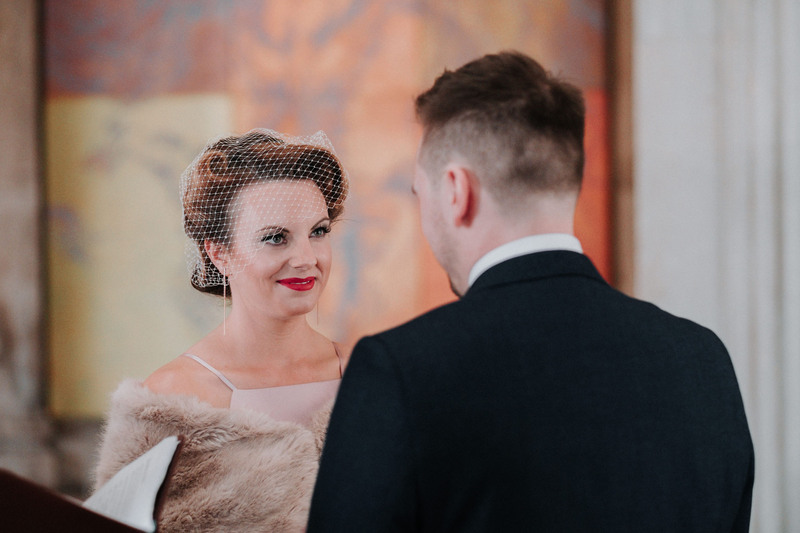 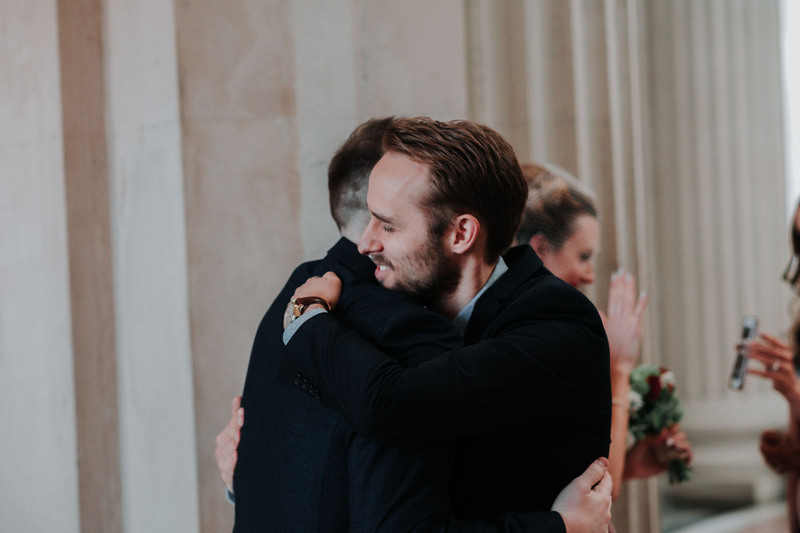 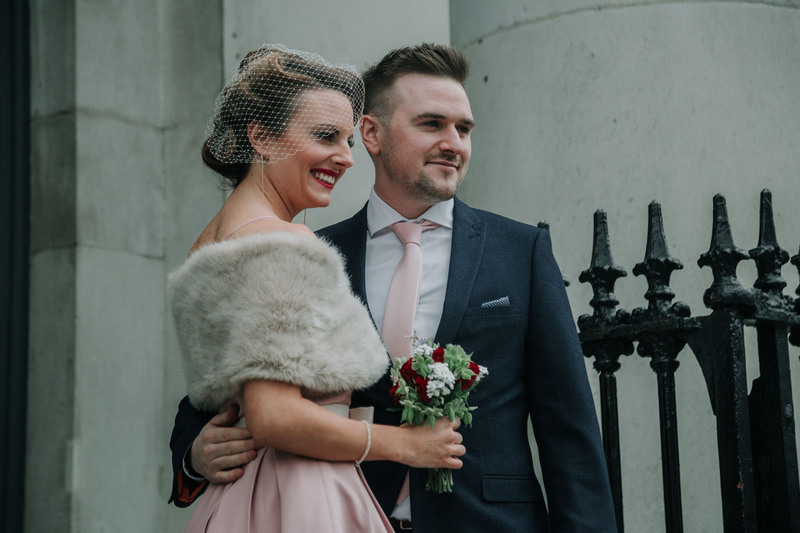 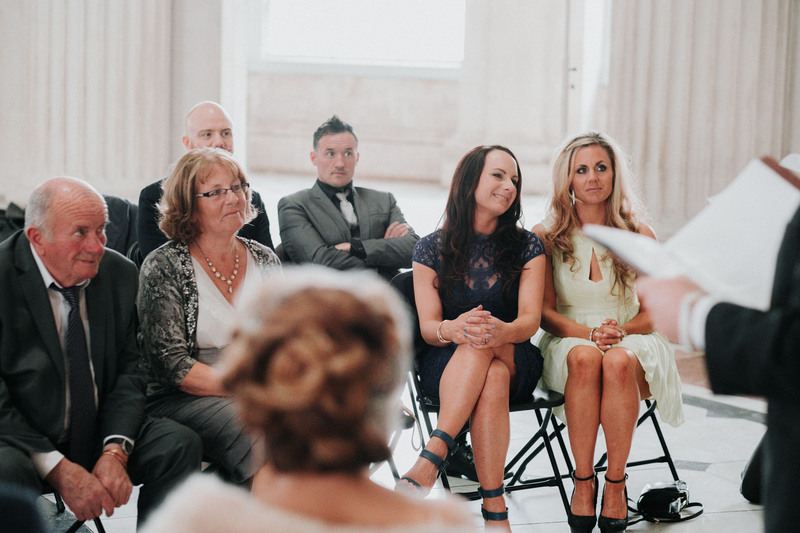 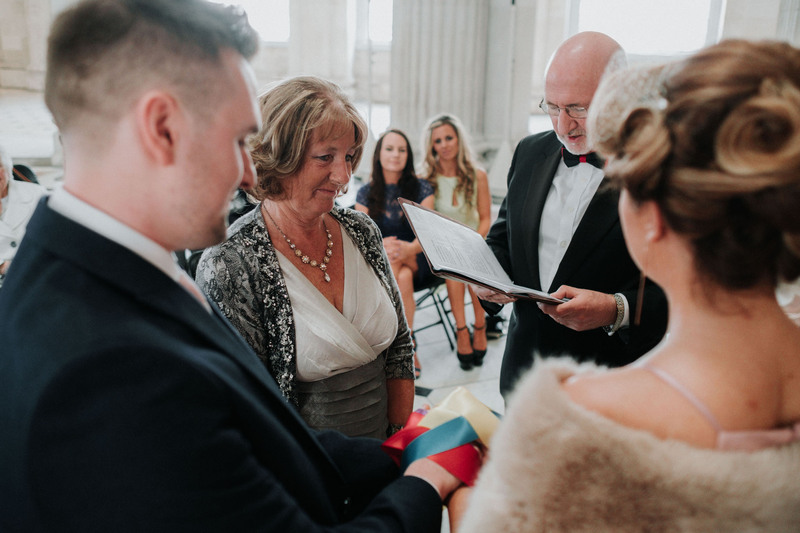 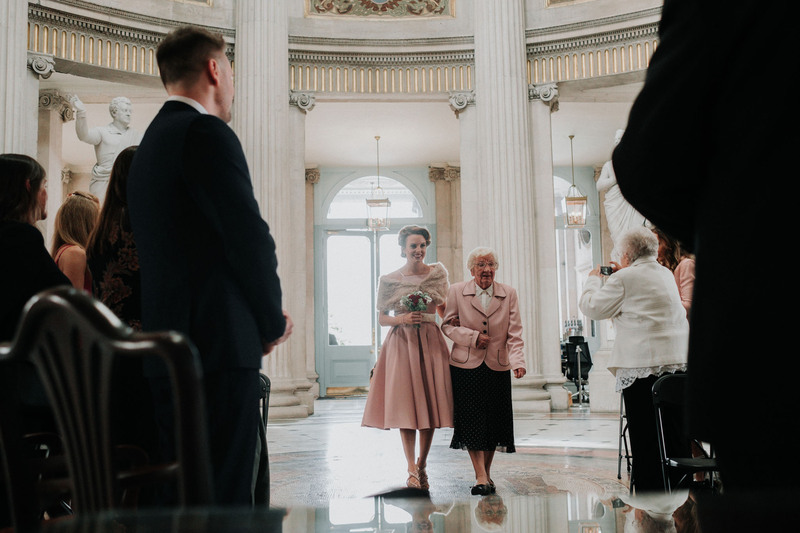 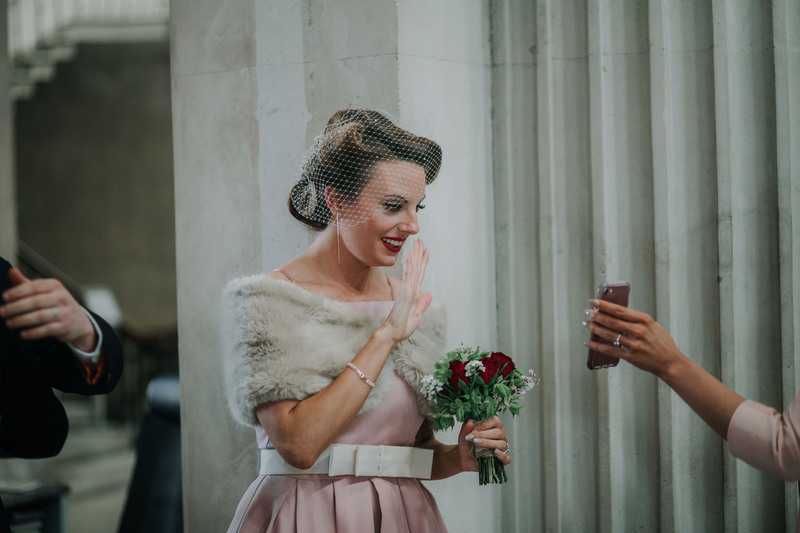 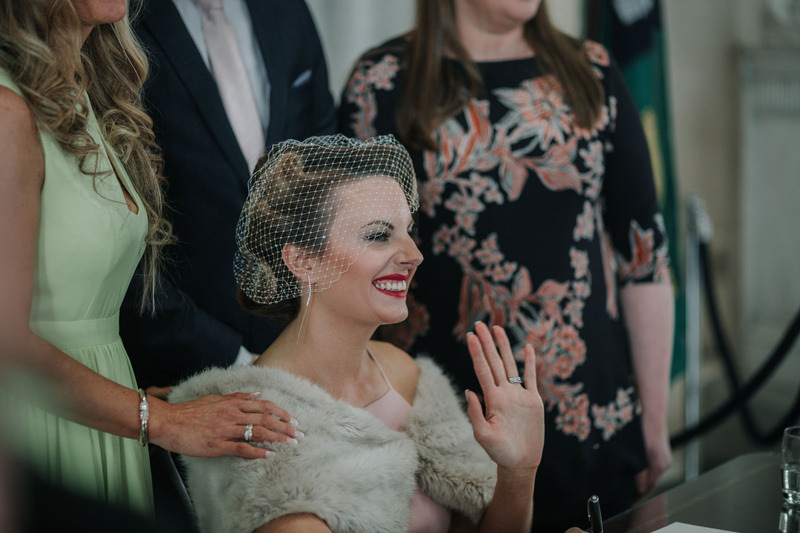 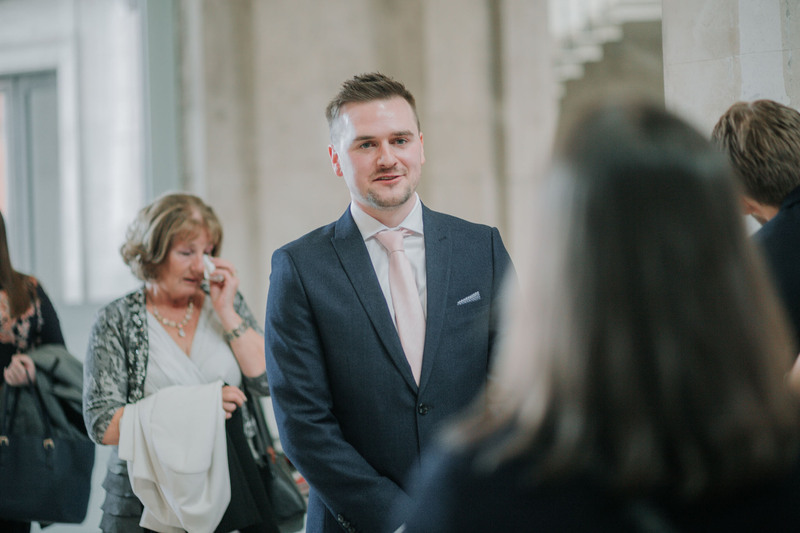 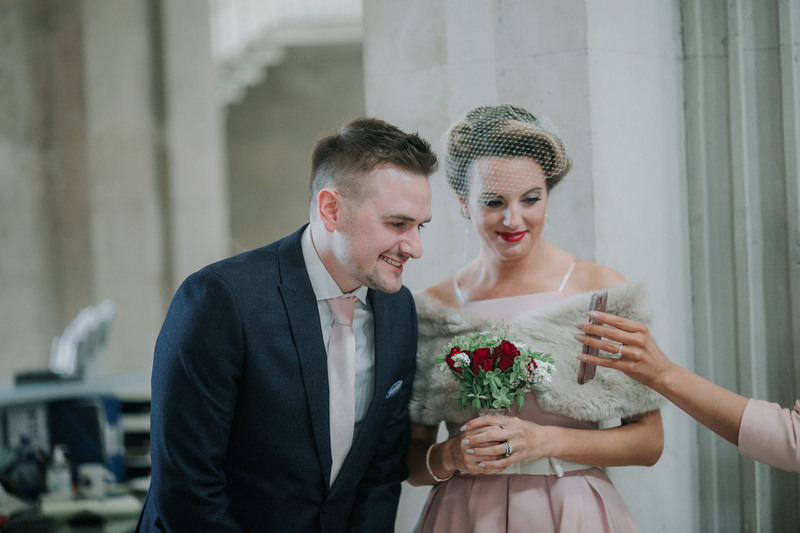 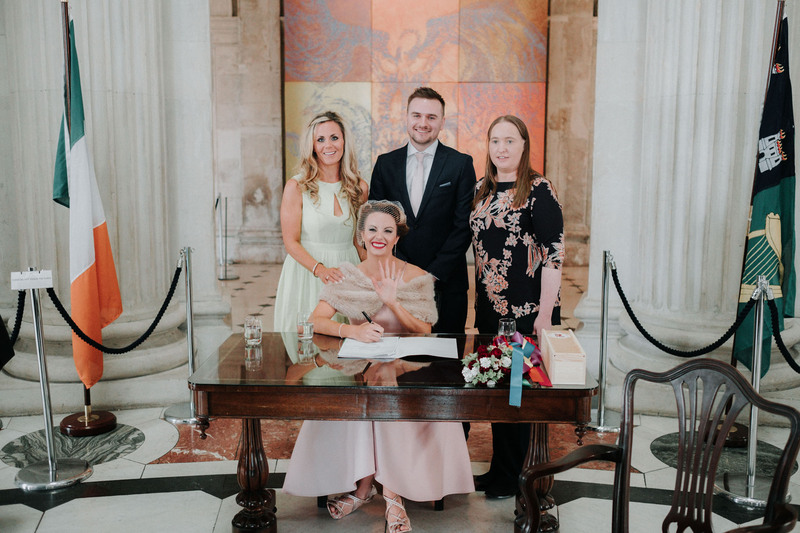 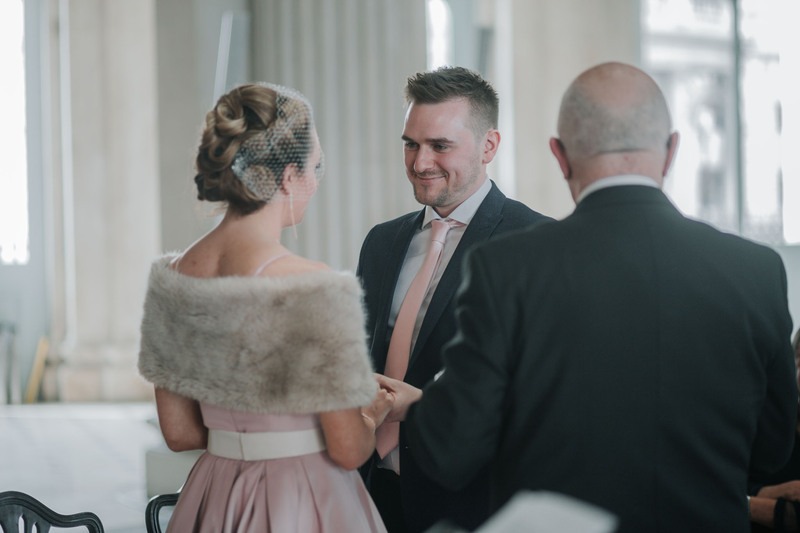 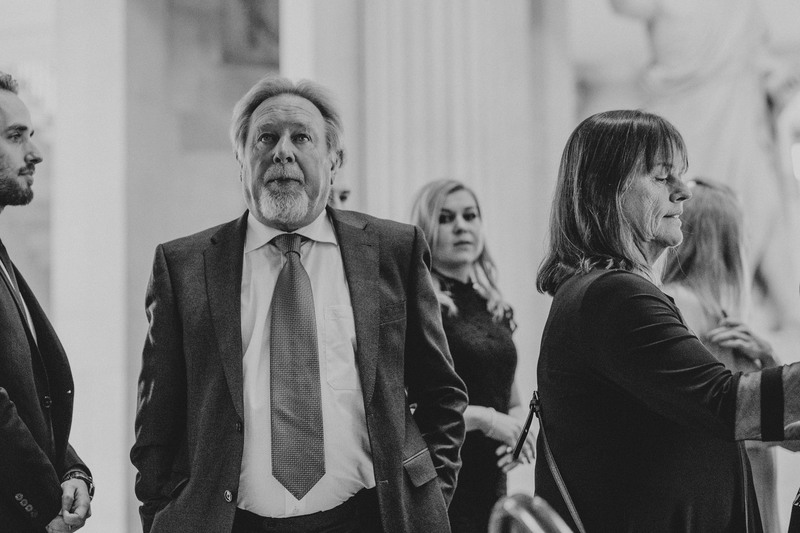 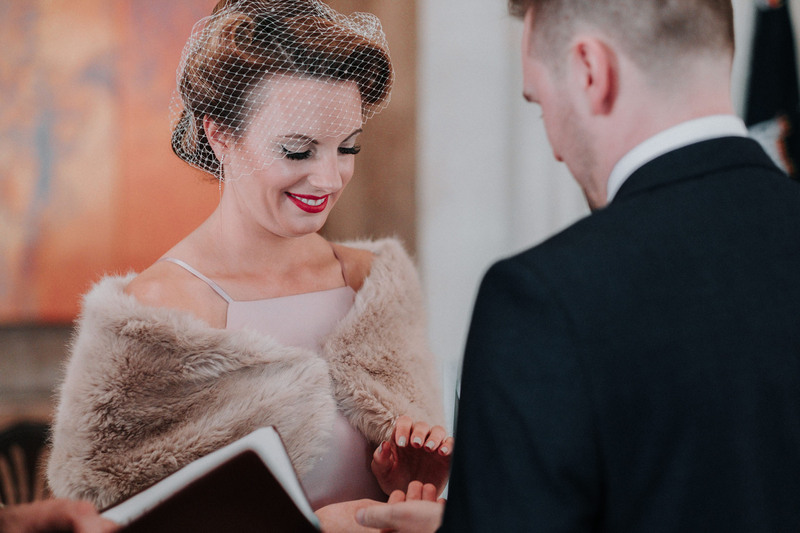 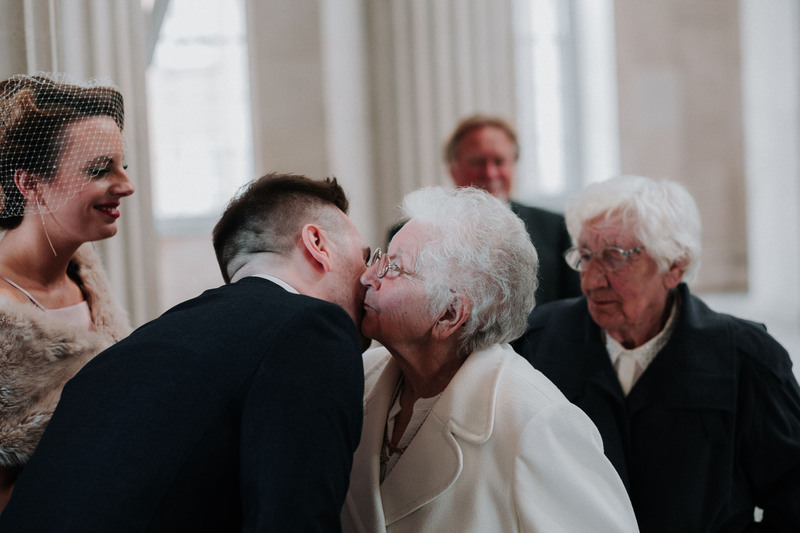 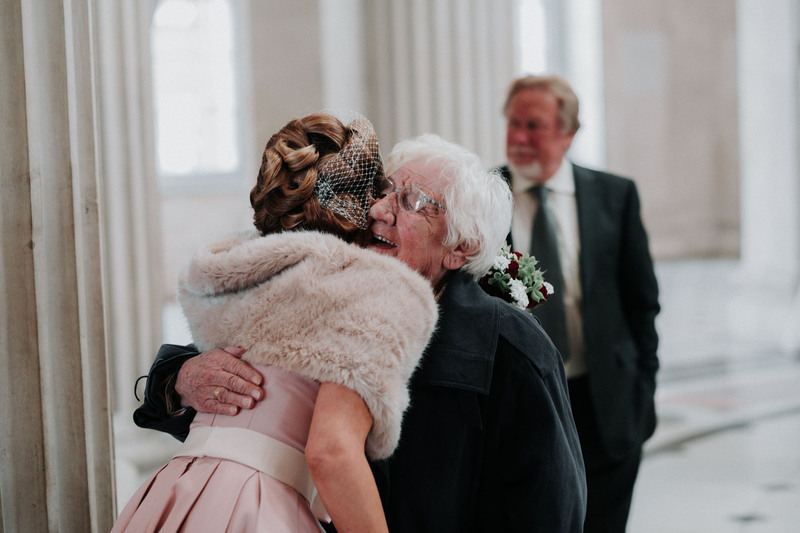 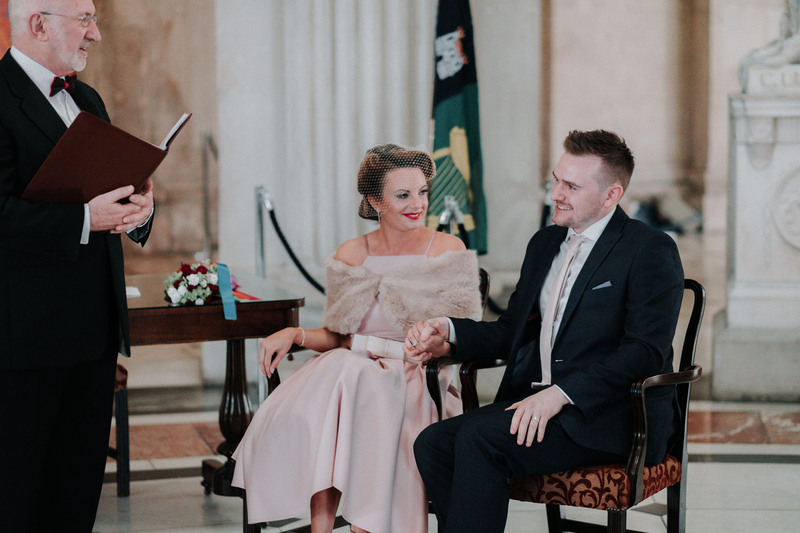 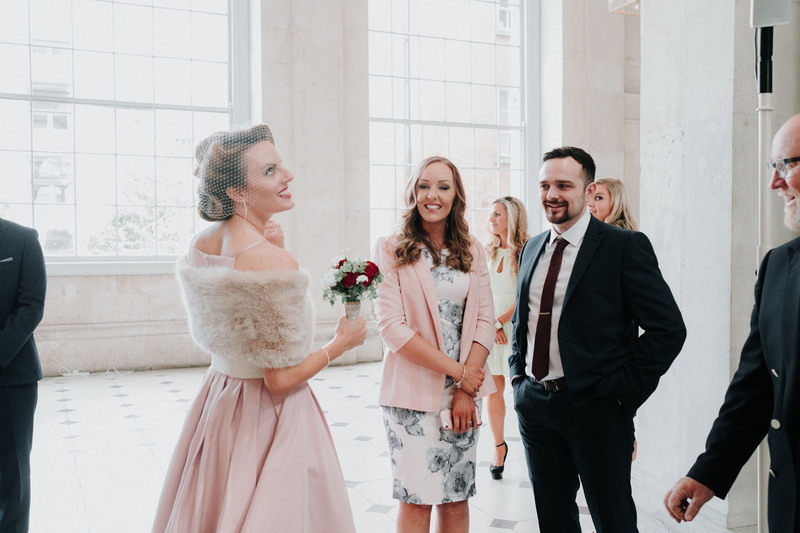 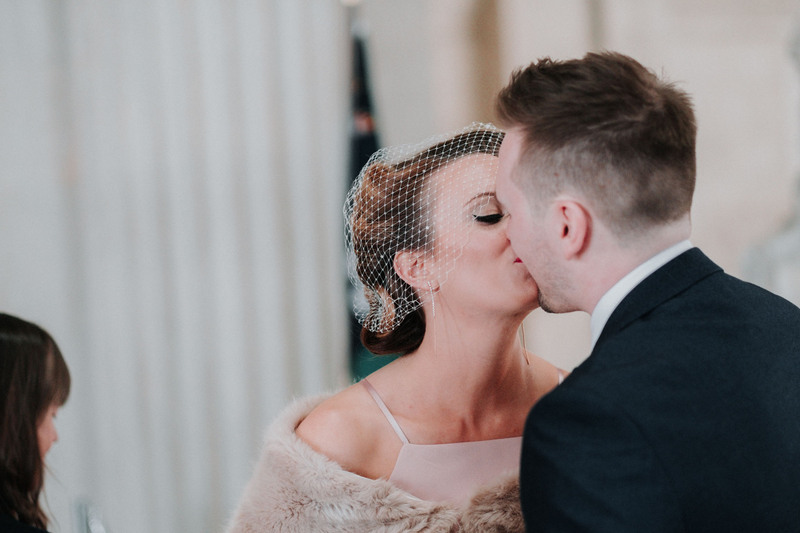 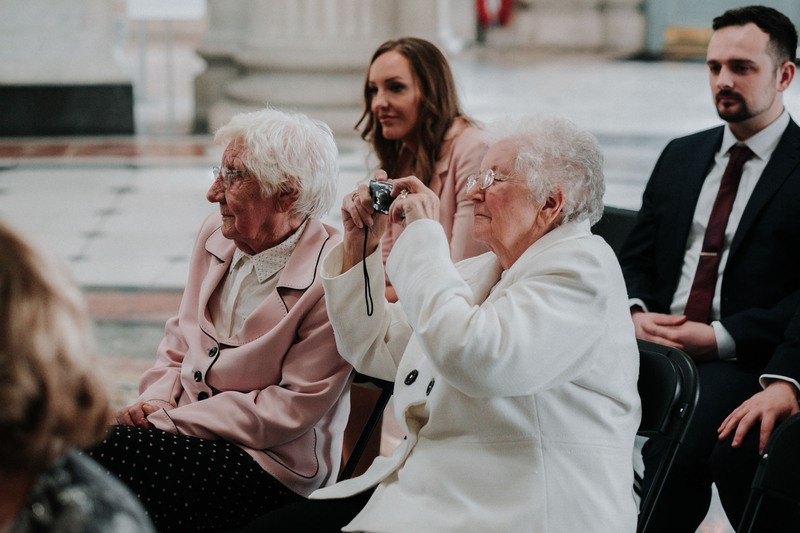 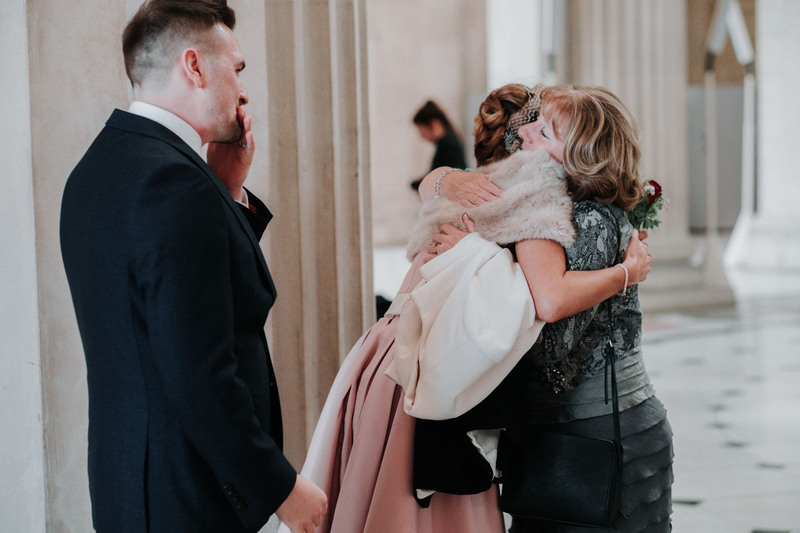 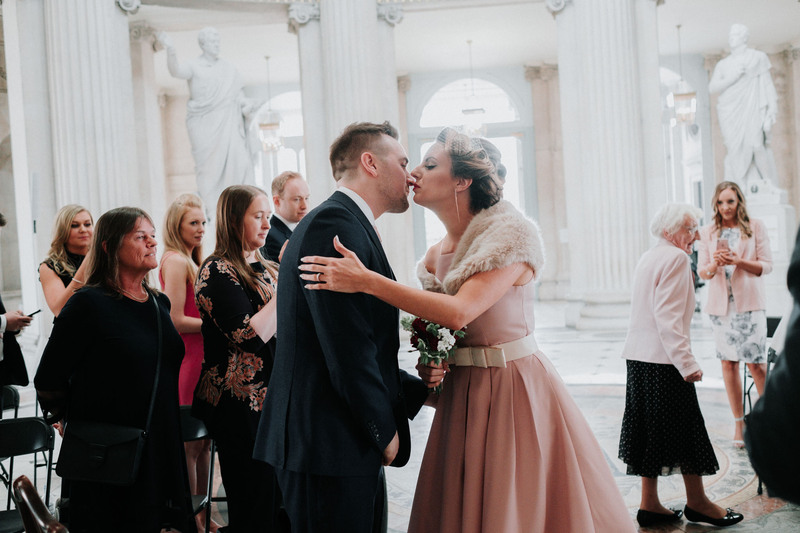 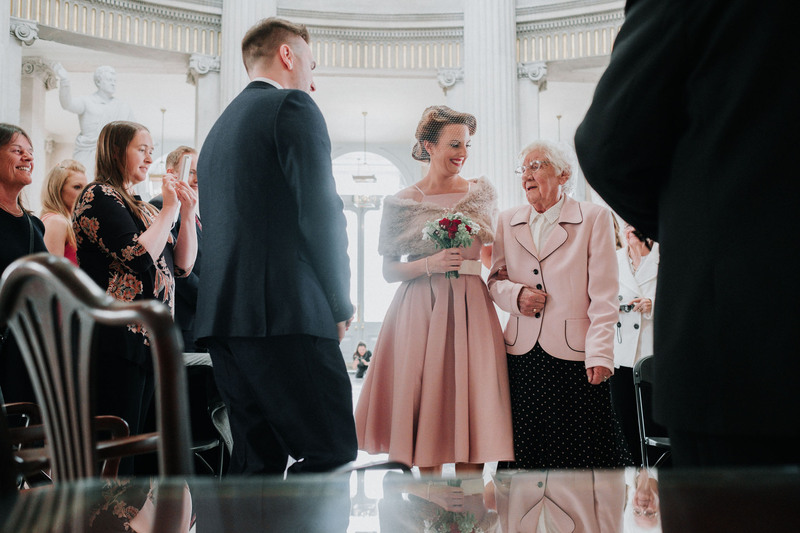 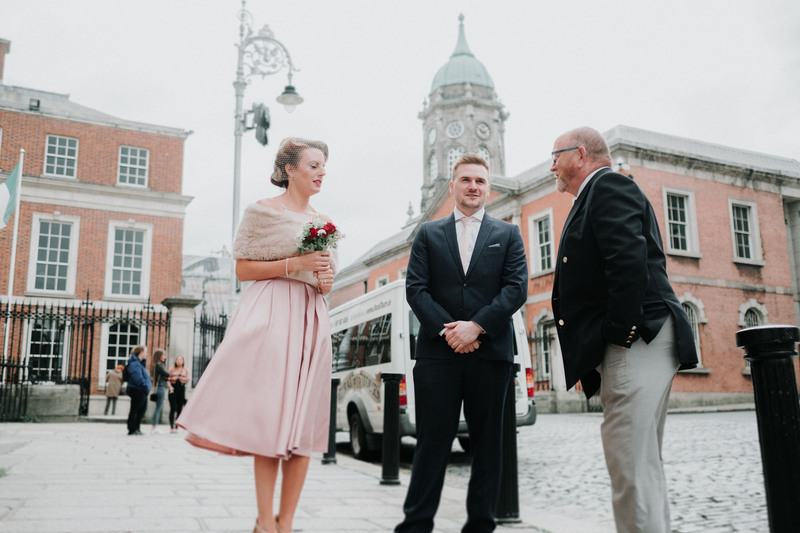 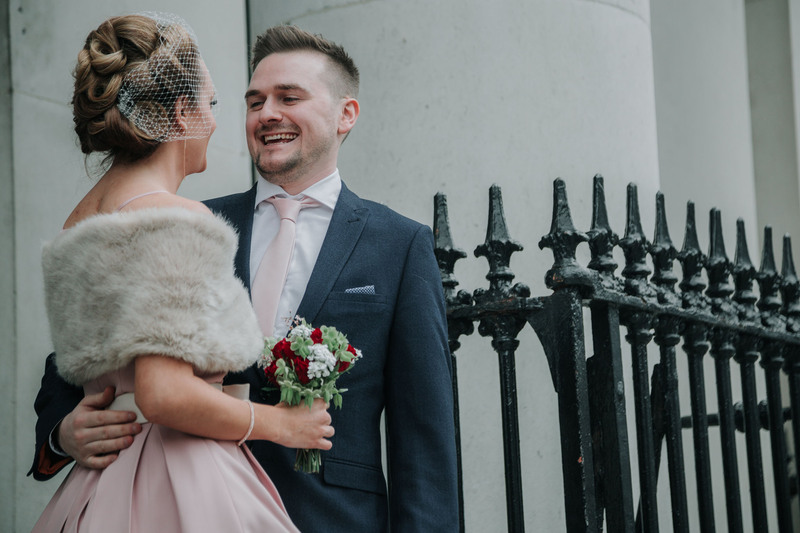 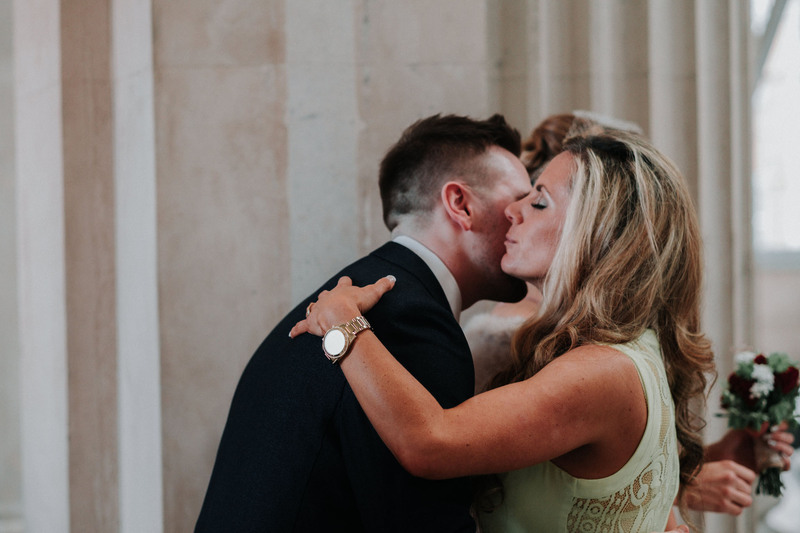 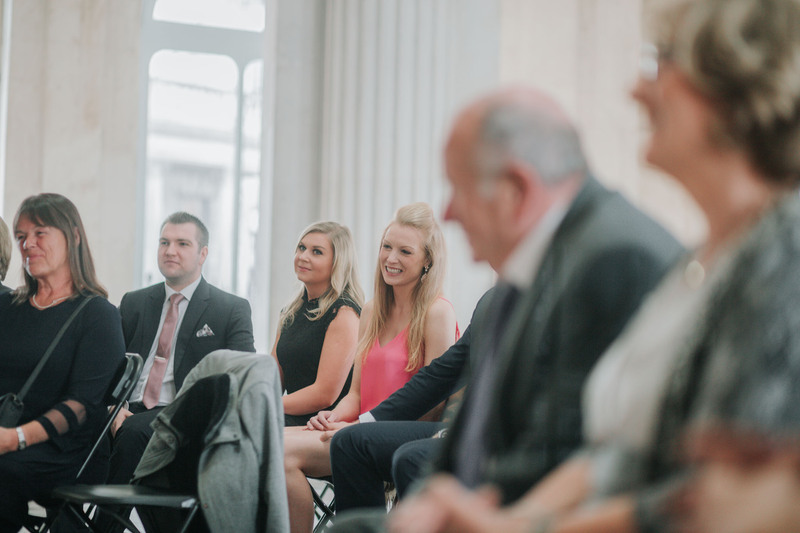 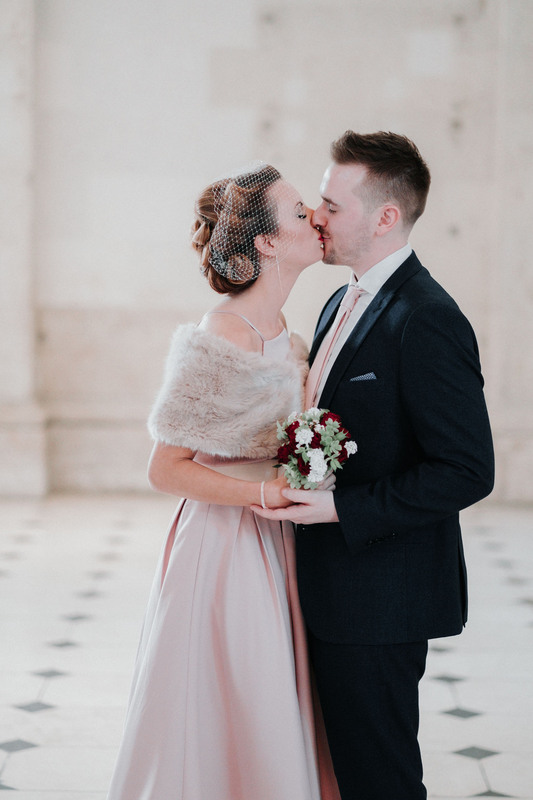 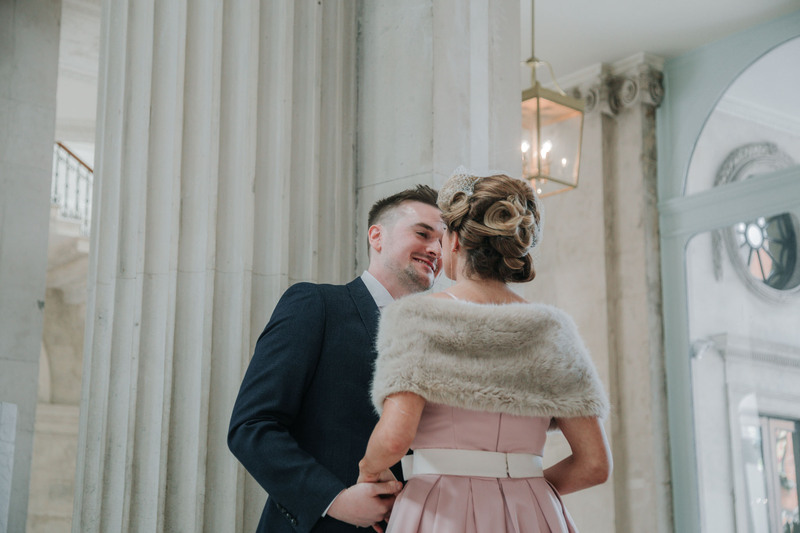 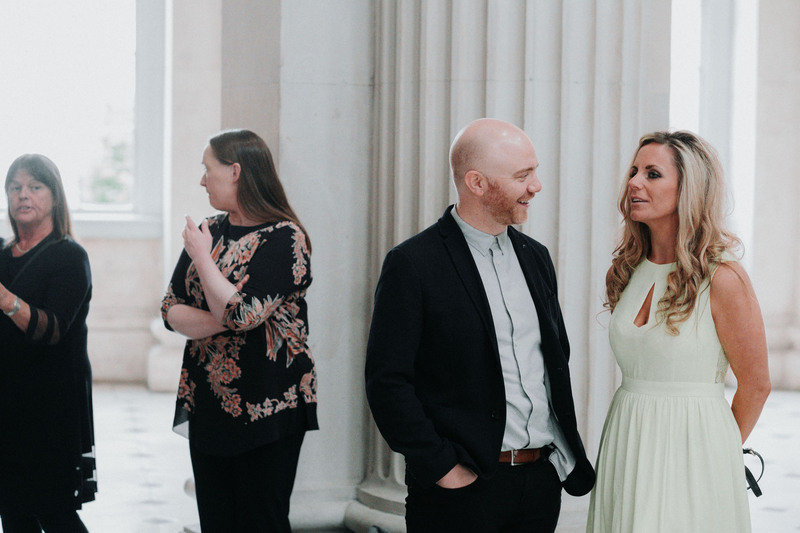 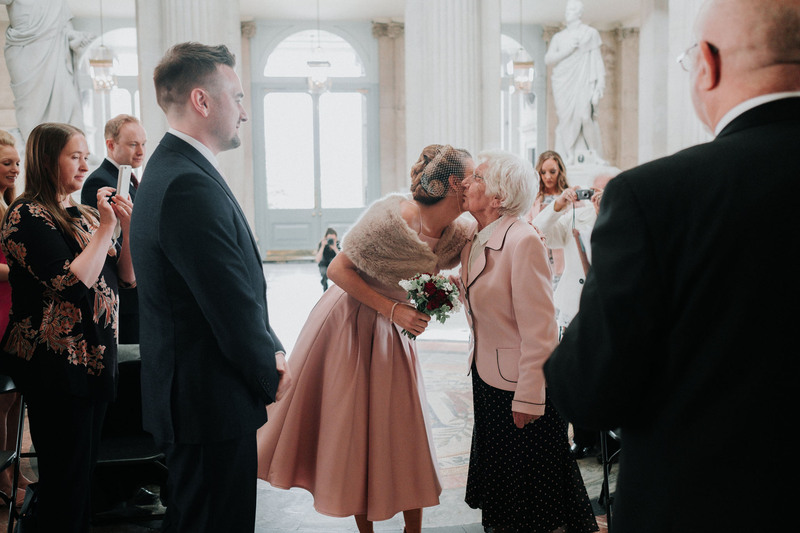 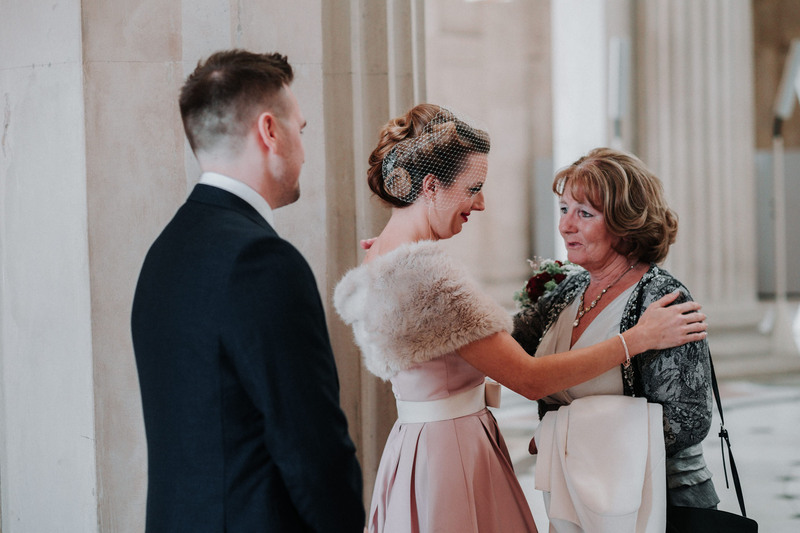 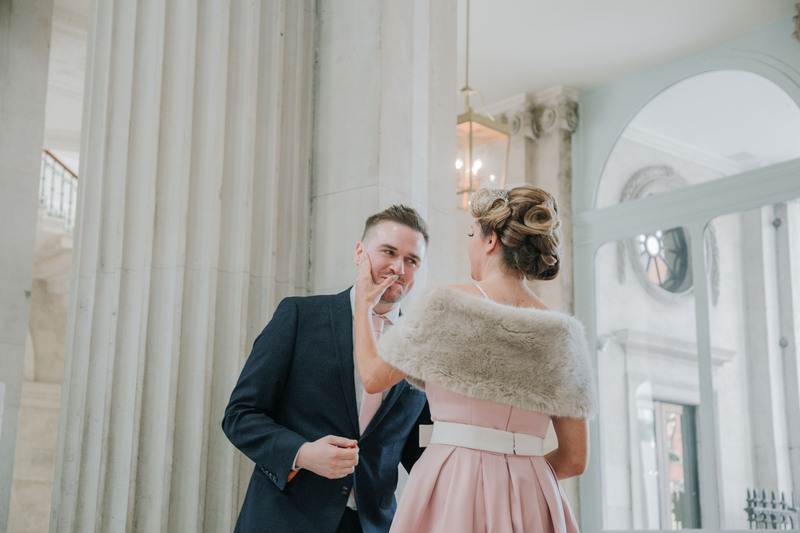 Family and friends gathered excitingly into the Dublin City Hall wedding to witness Rebecca and Craig’s exchange their vows. 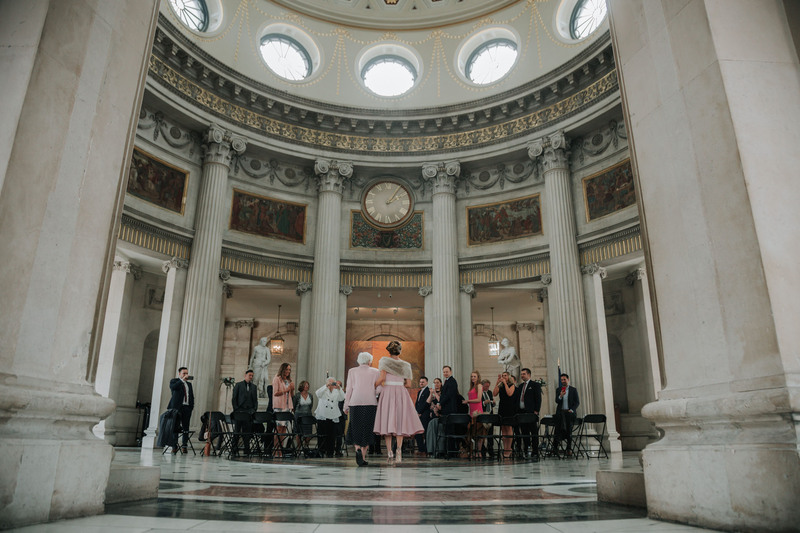 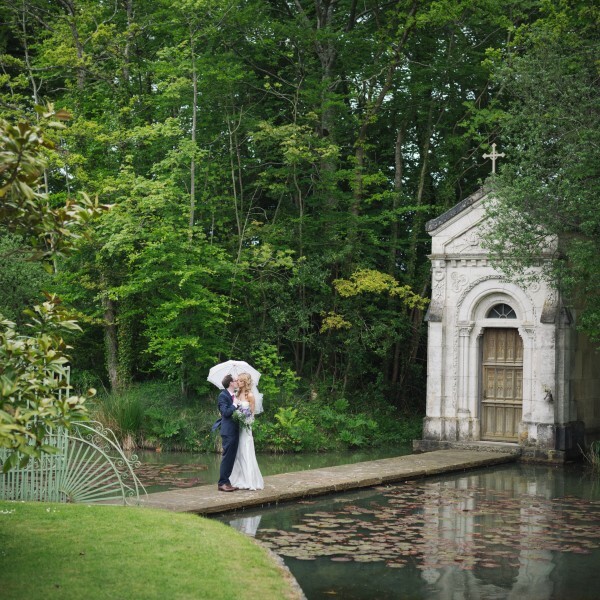 The venue, built in the late 18th century suited the event perfectly. 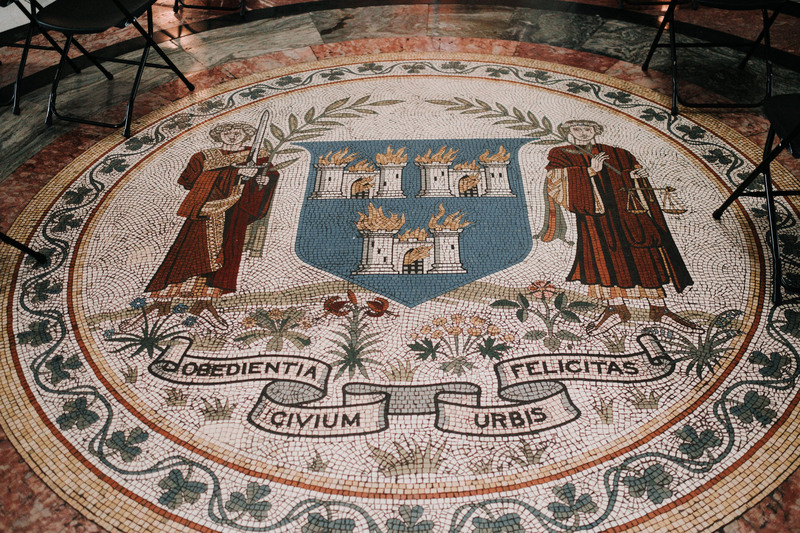 One would think they were already in Spain with the surrounding mosaic tilings, high ceilings, wall murals and chandeliers. 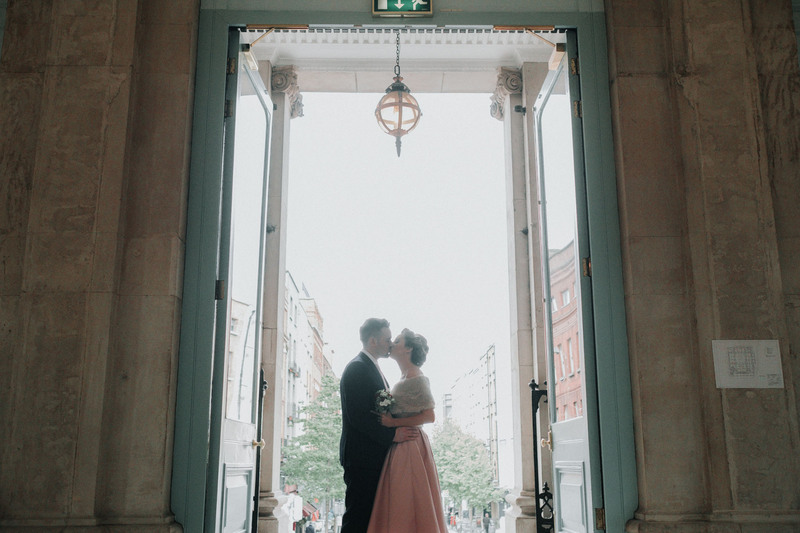 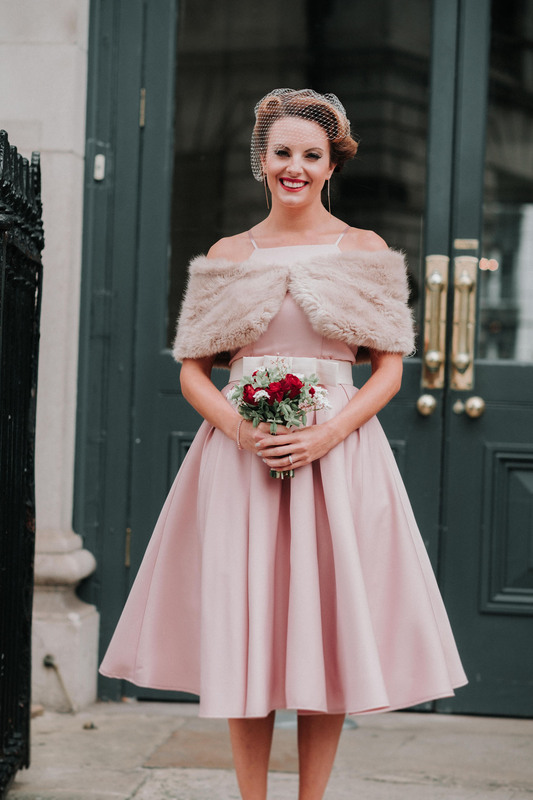 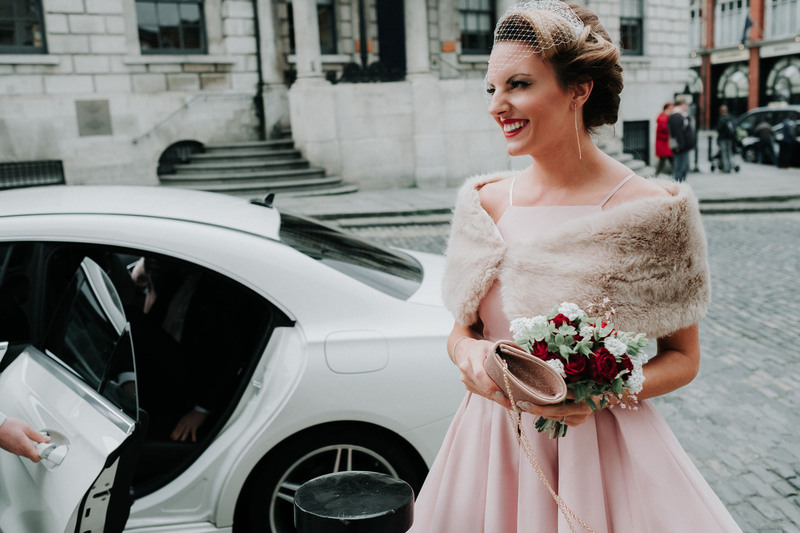 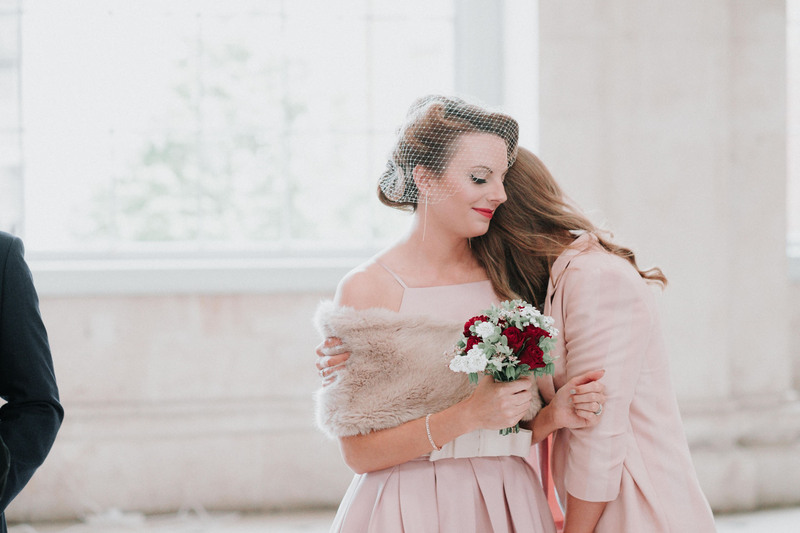 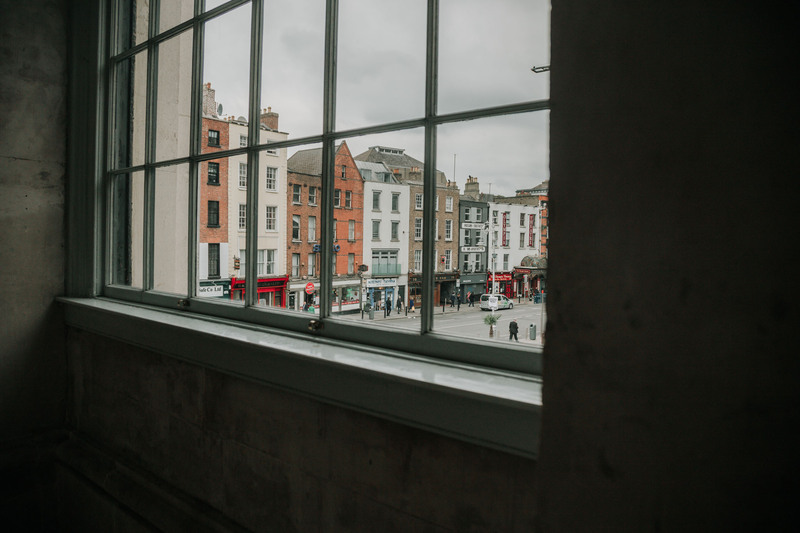 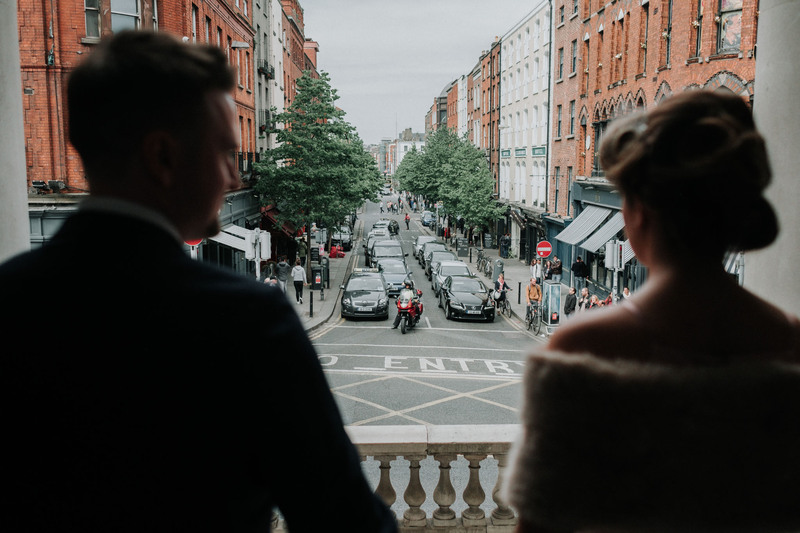 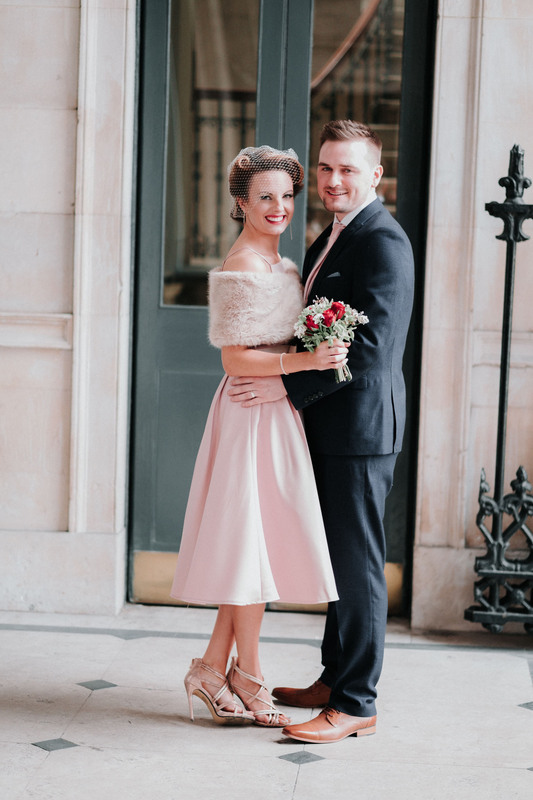 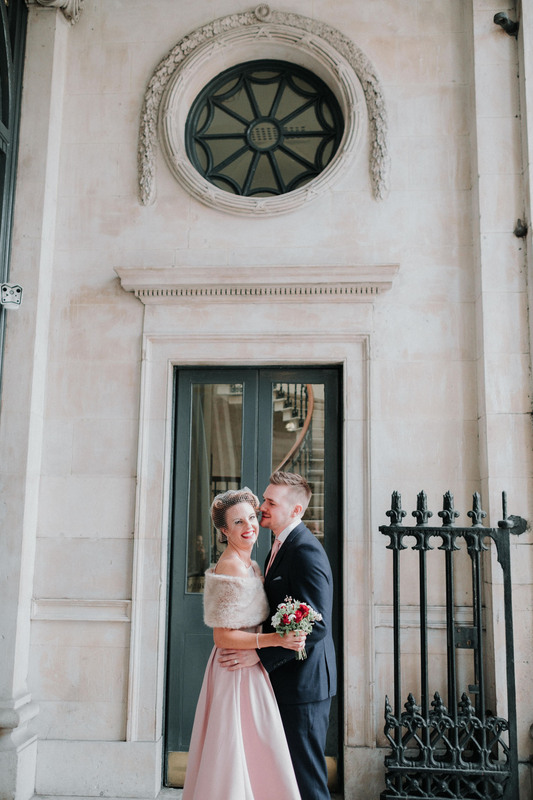 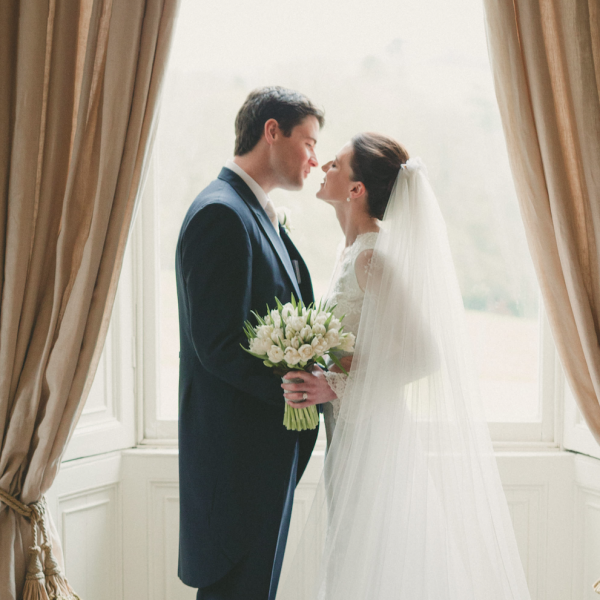 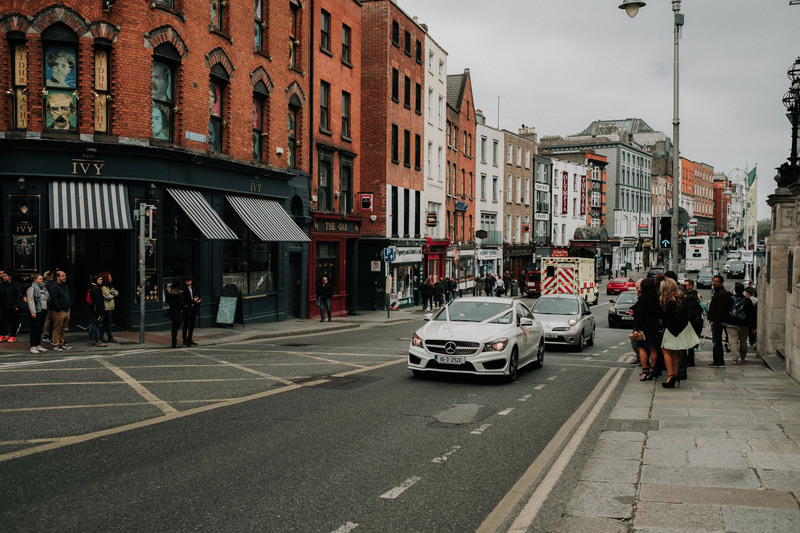 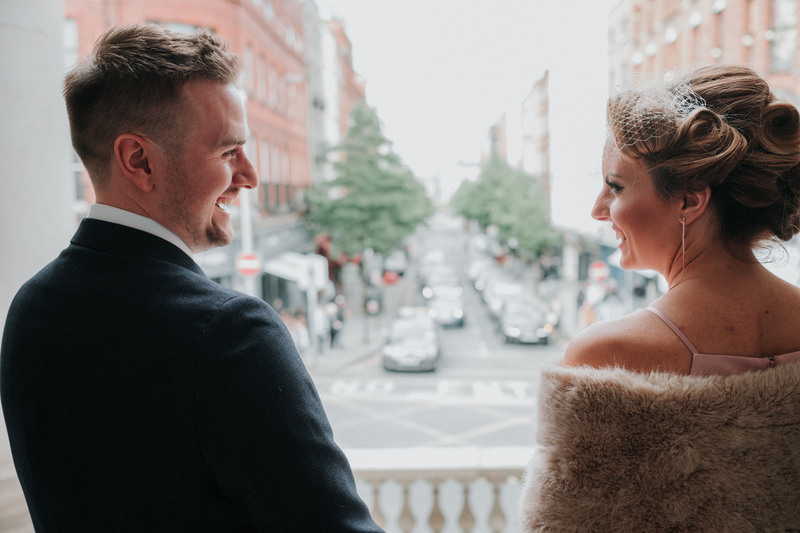 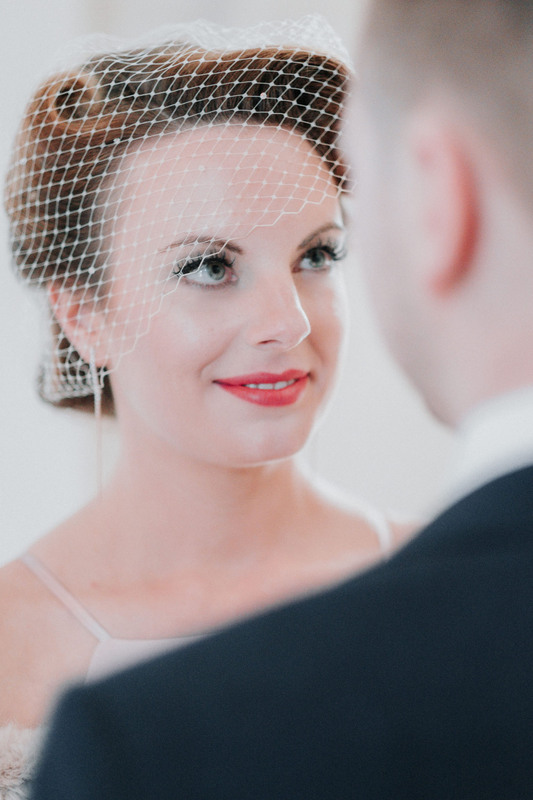 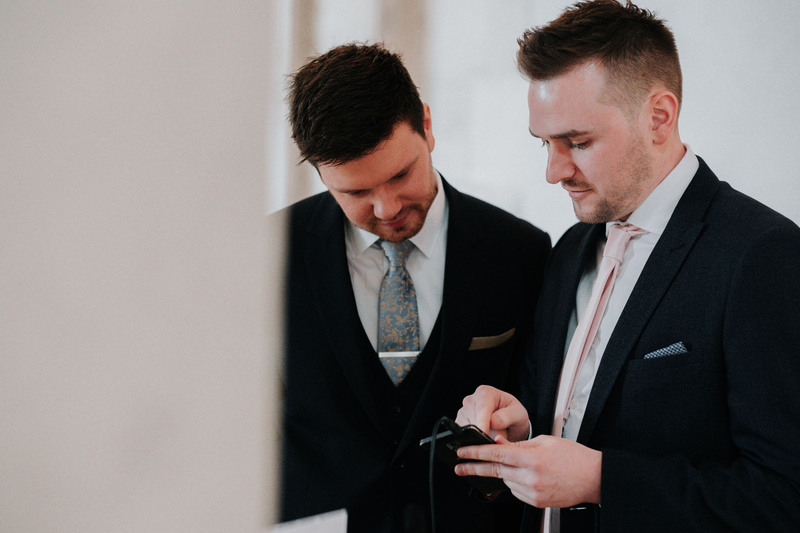 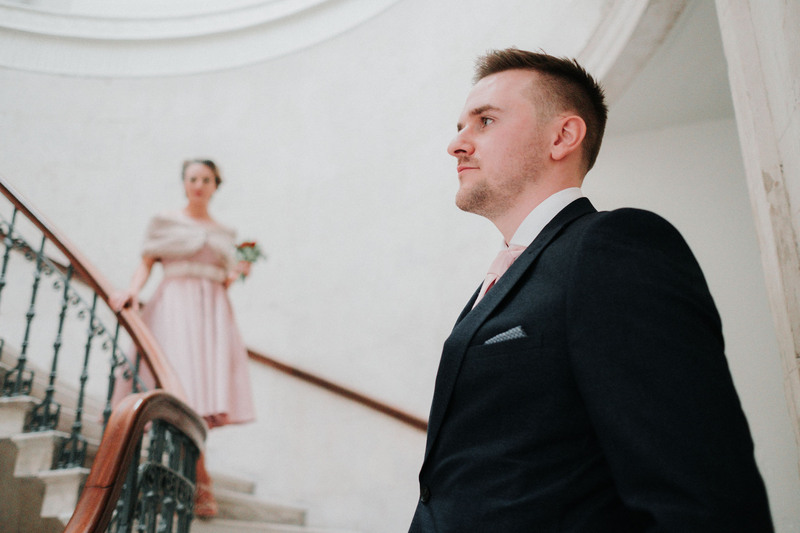 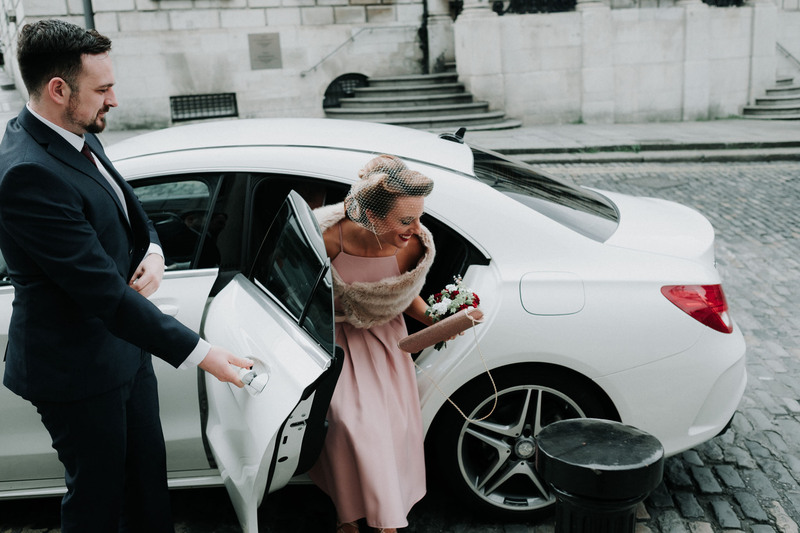 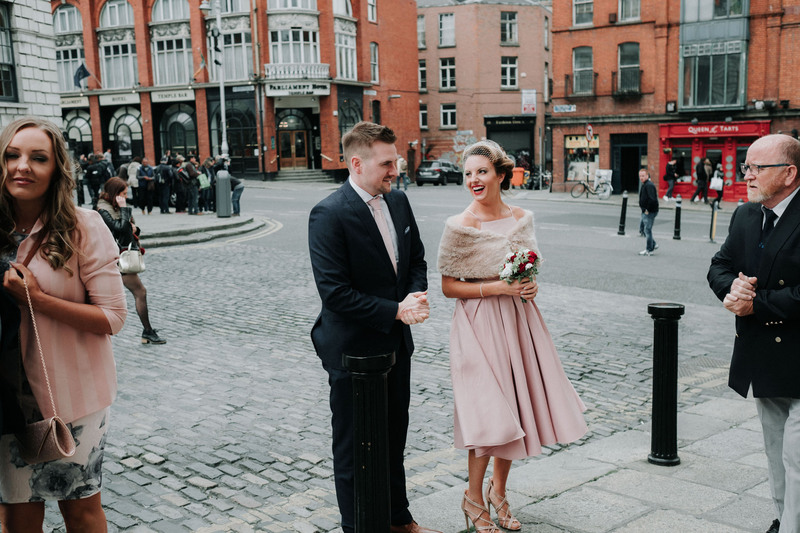 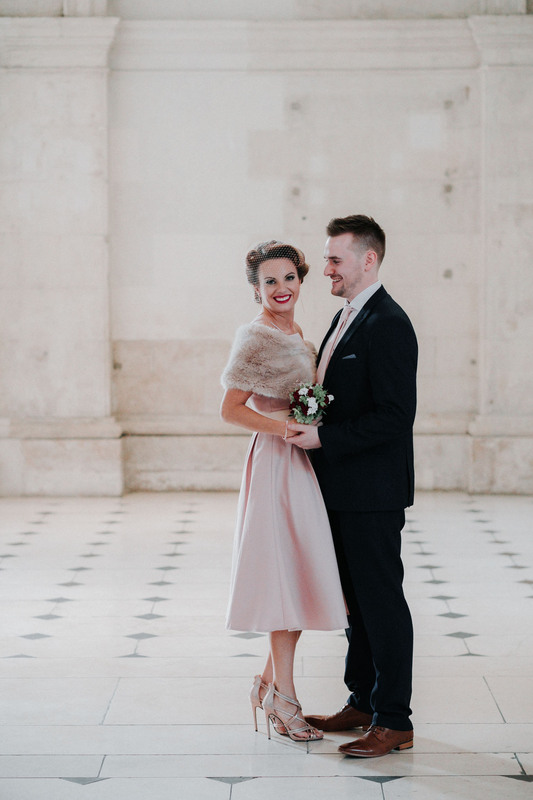 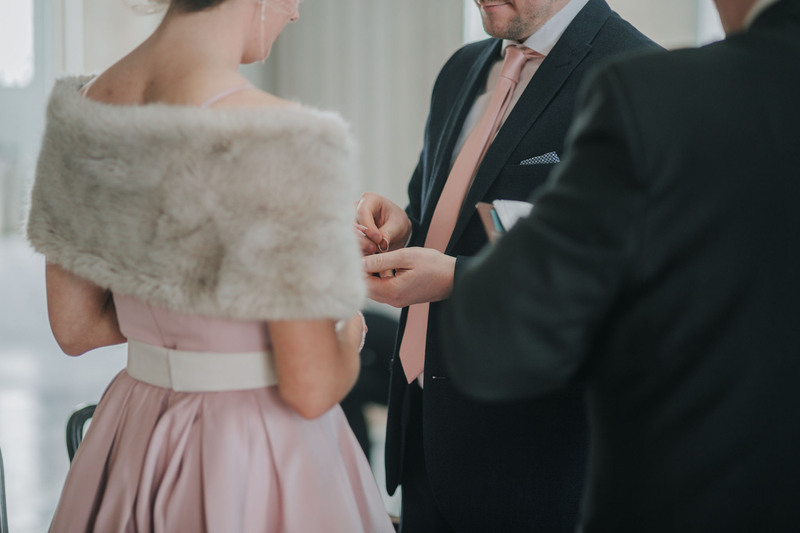 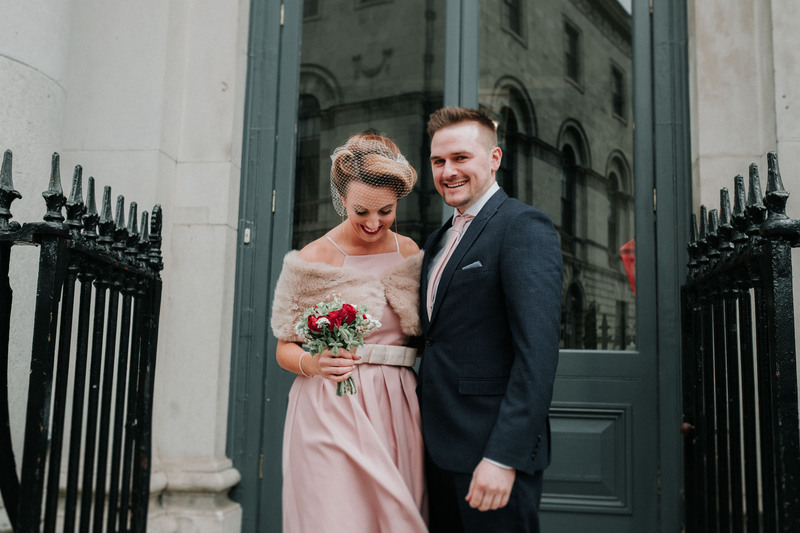 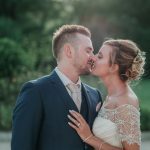 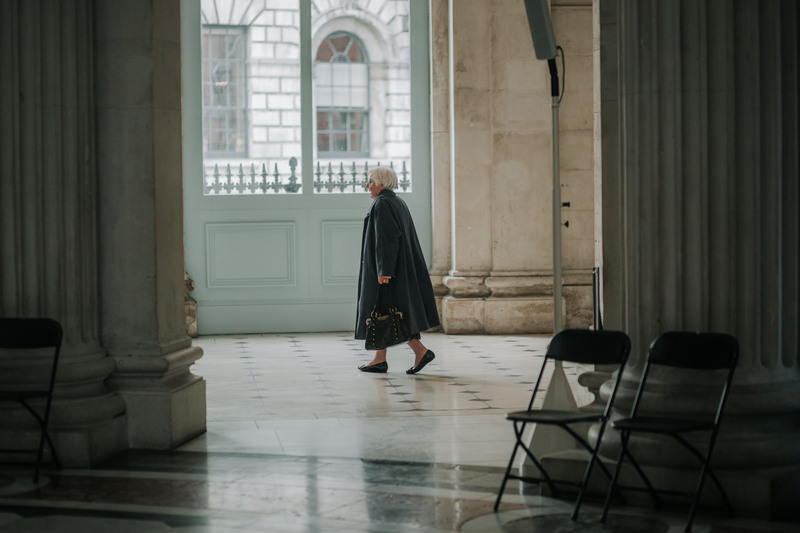 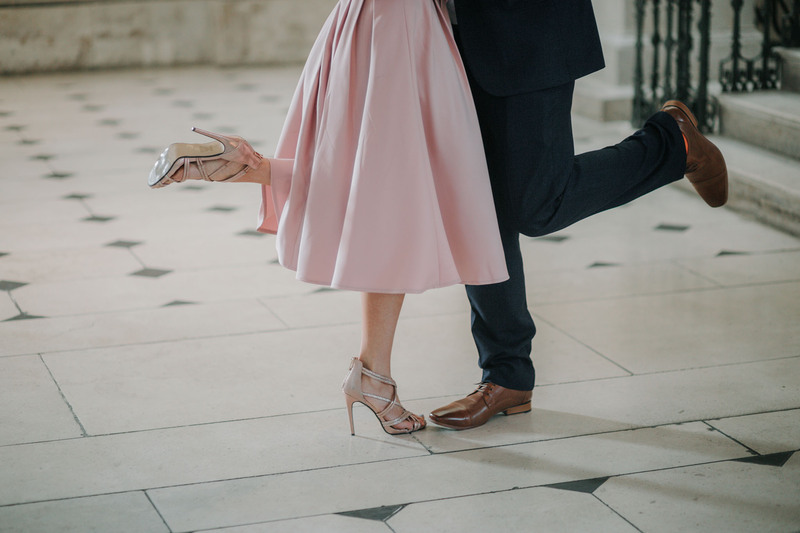 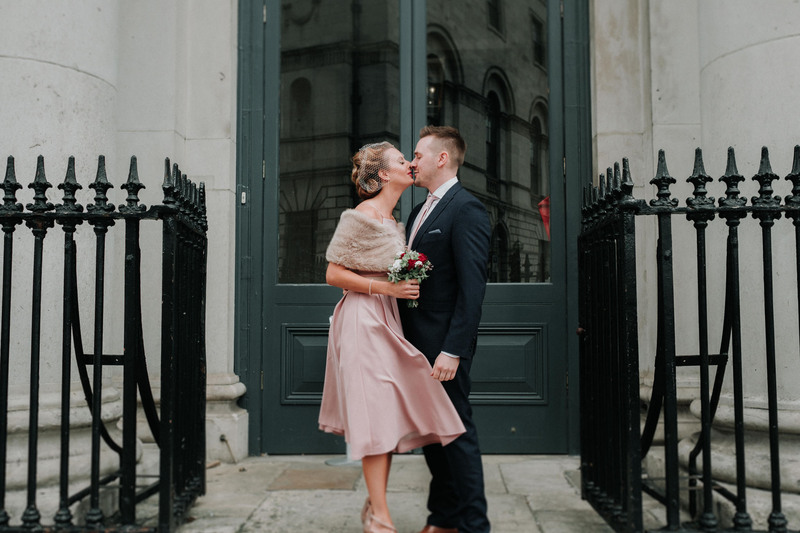 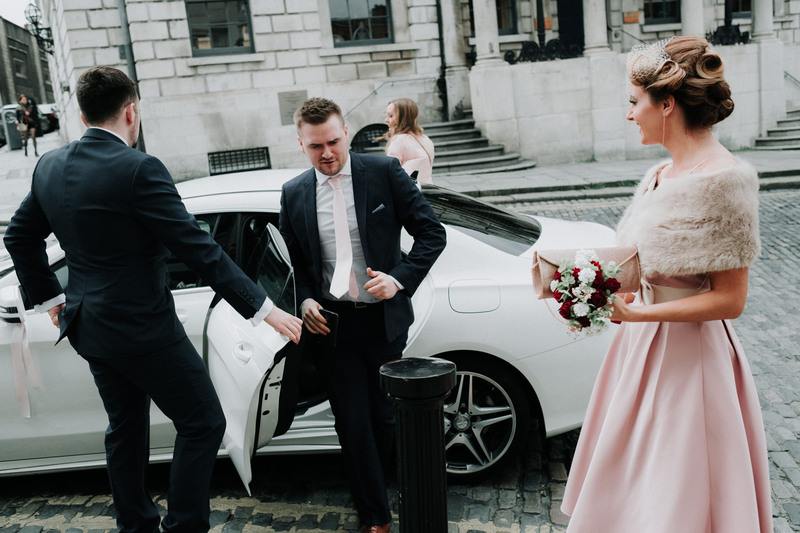 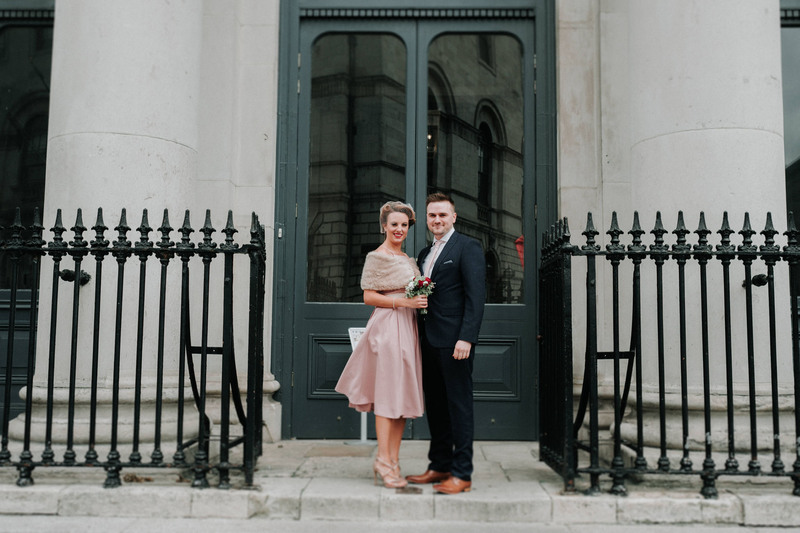 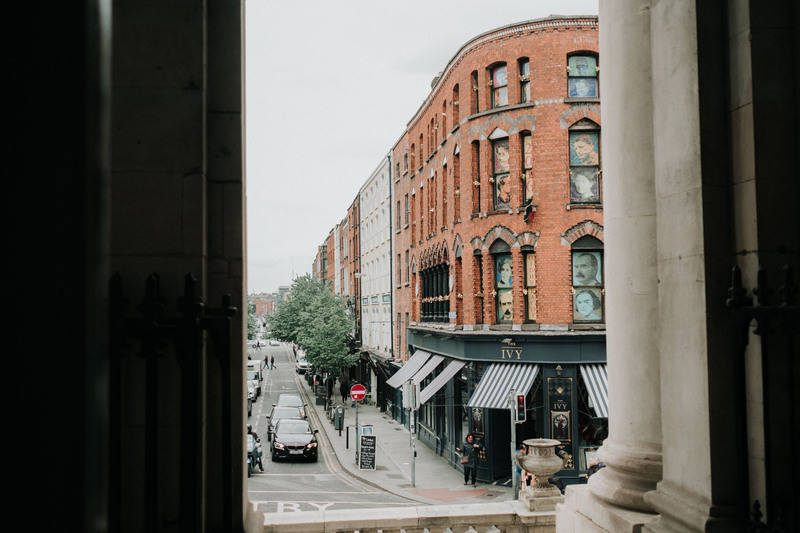 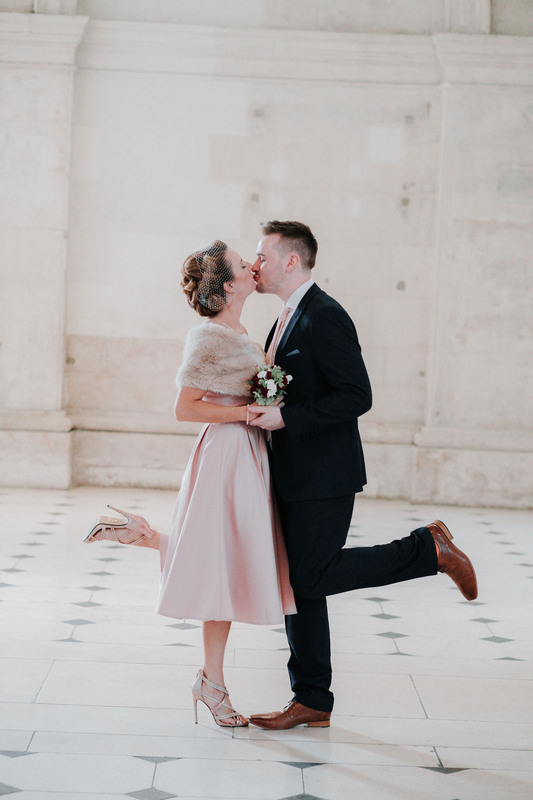 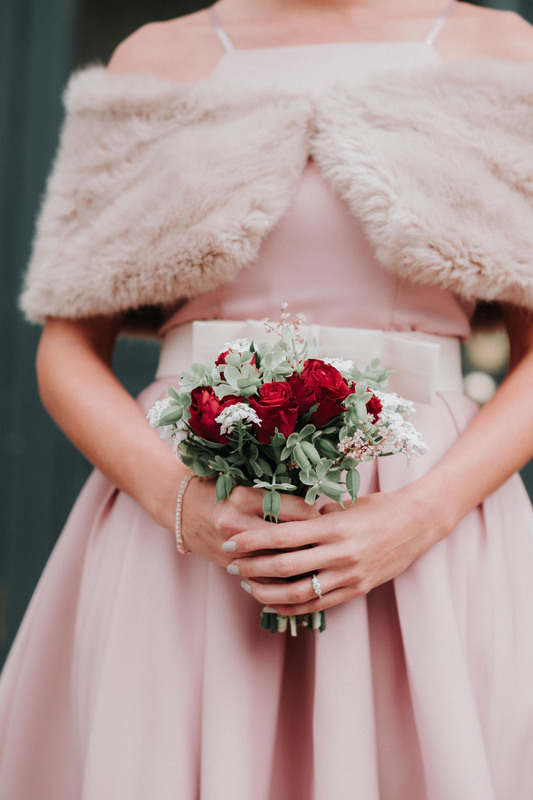 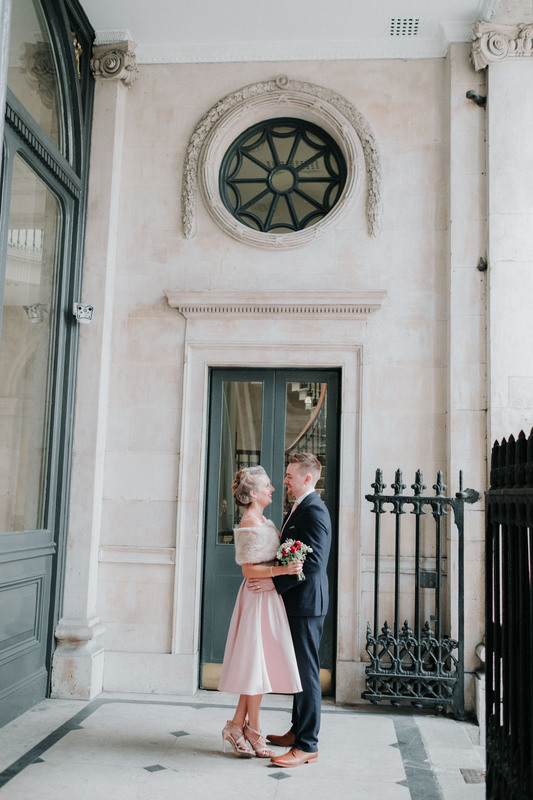 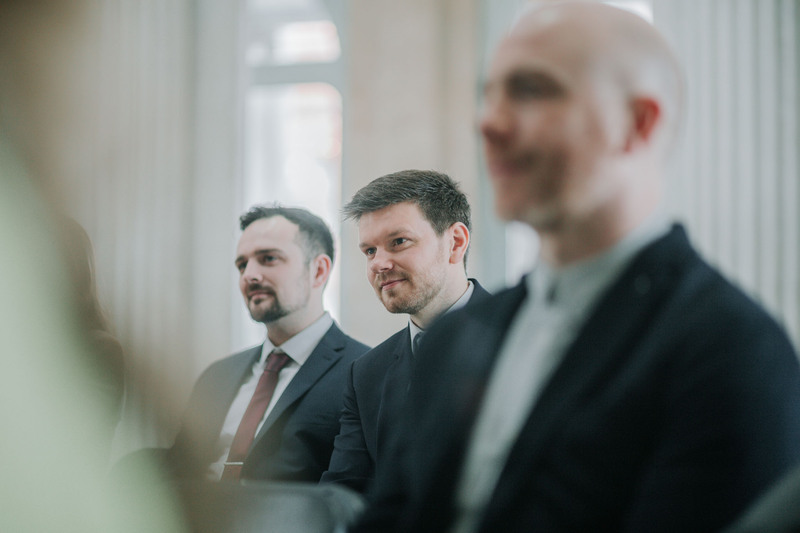 You’d only have to look outside the windows to view many of Dublin Cities quirky, multi–colored and quaintly slanted buildings, to be quickly reminded that indeed this was a Dublin City Wedding. 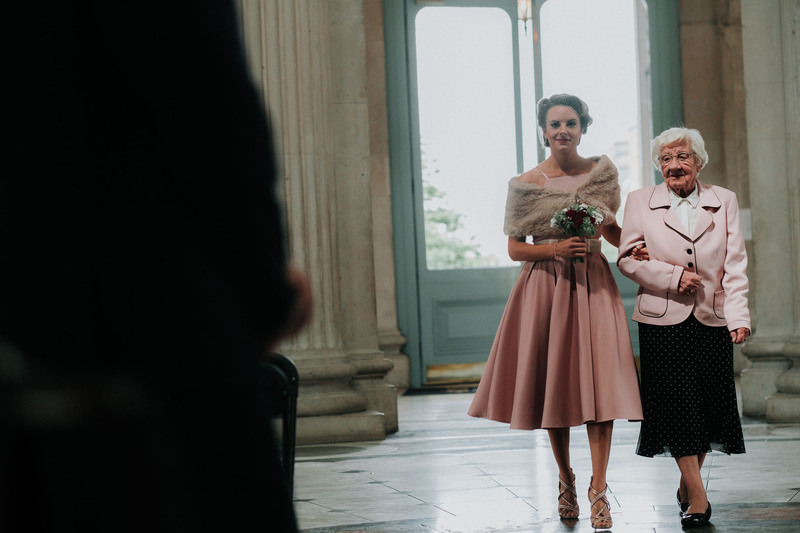 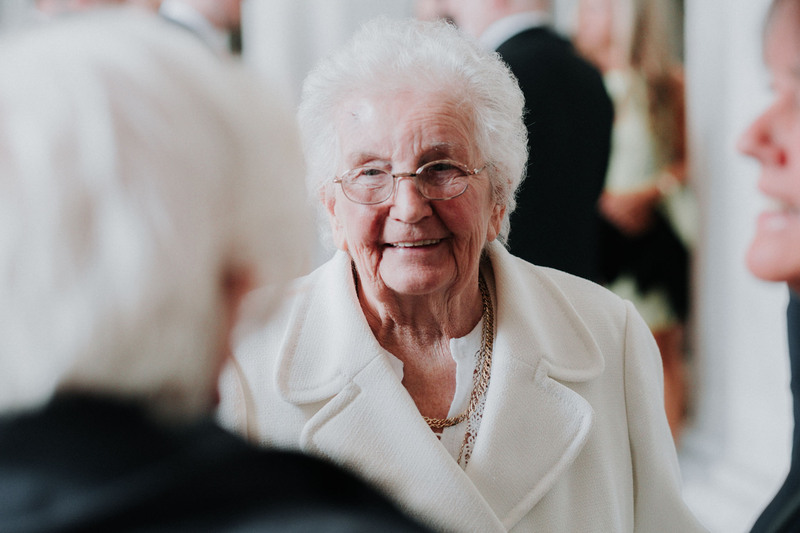 Rebecca’s lovely grandmother had the honuor of walking her granddaughter up the aisle where an eager Craig awaited. 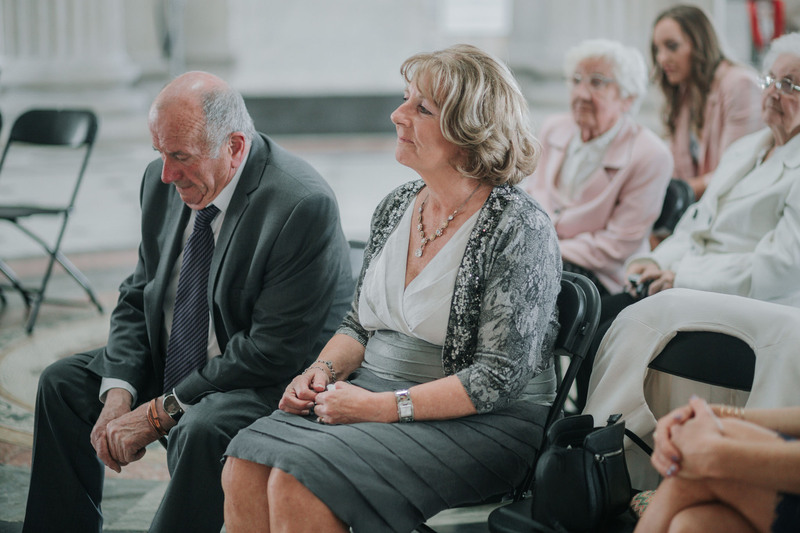 It was clear to see that Rebecca was also honored to have the privilege of her Grandmothers company as they proceeded forward. 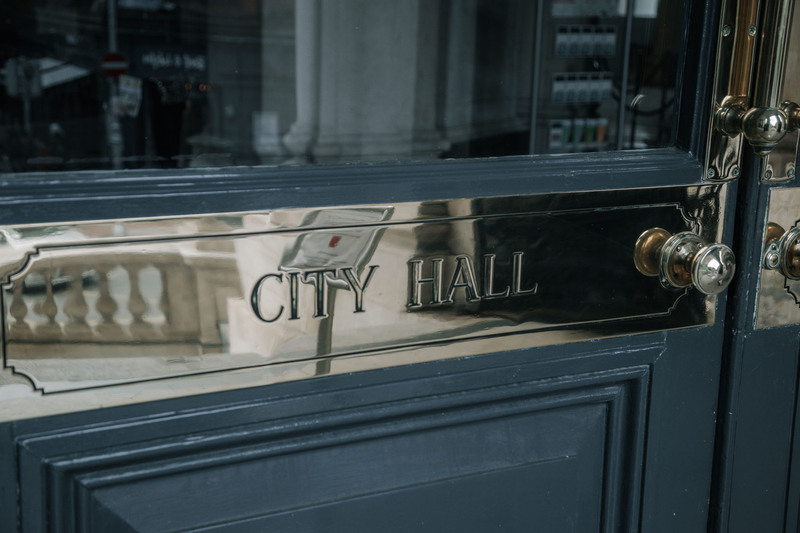 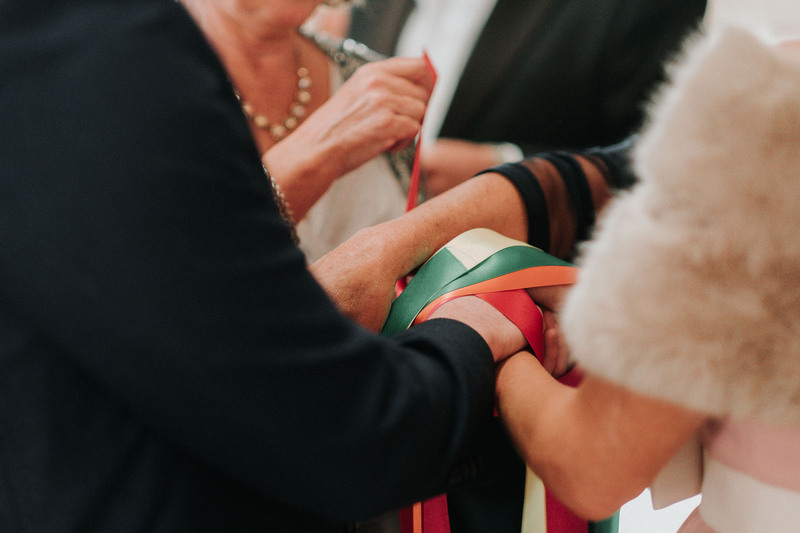 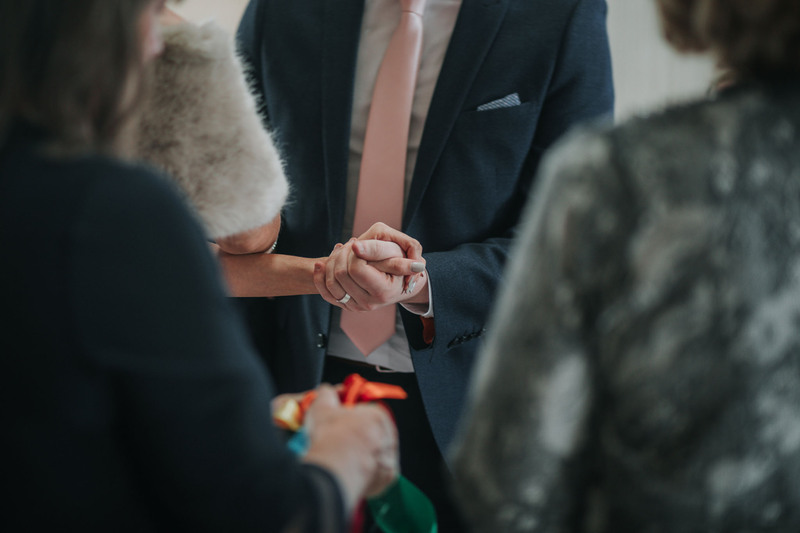 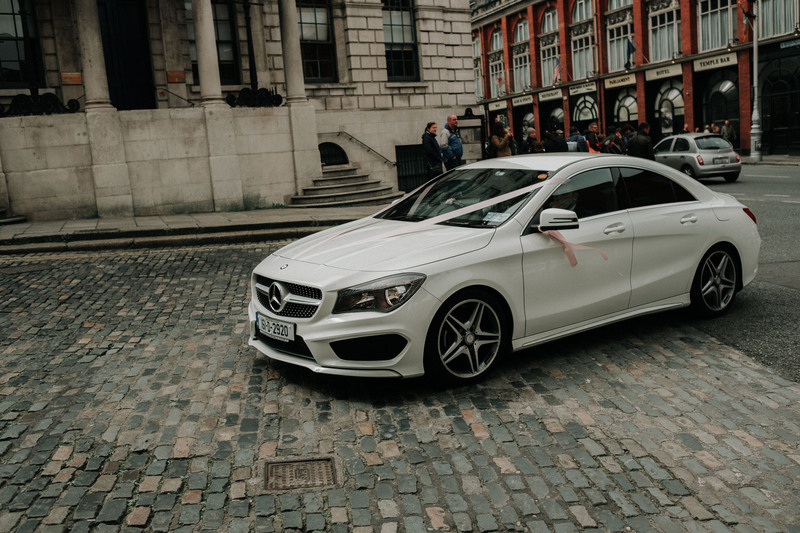 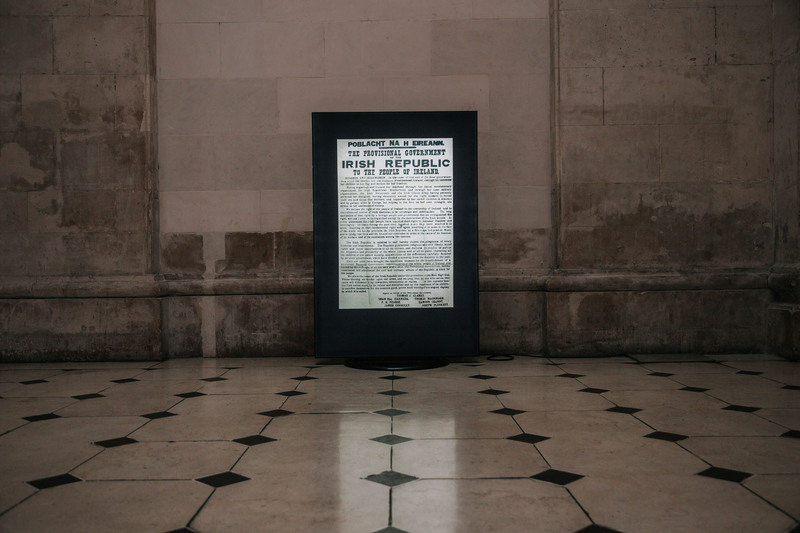 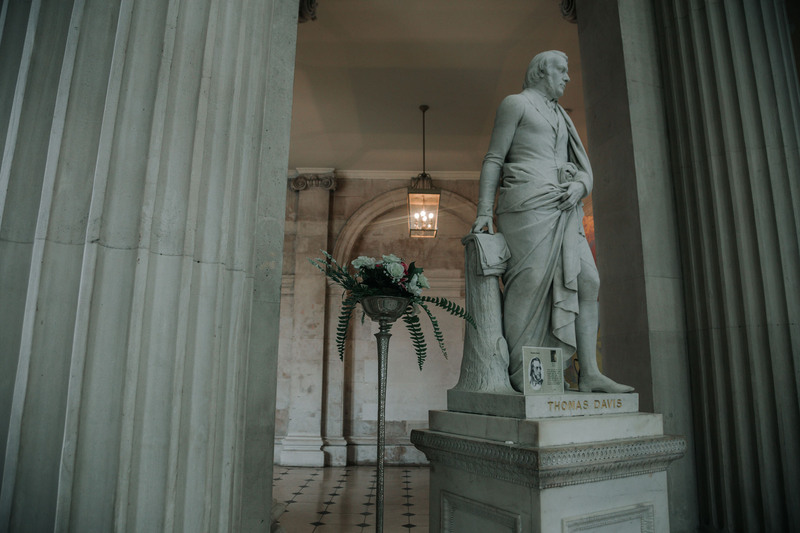 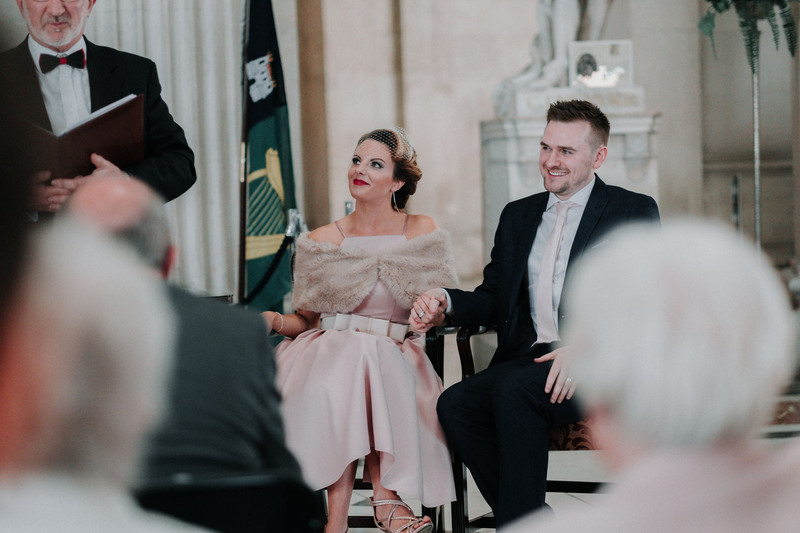 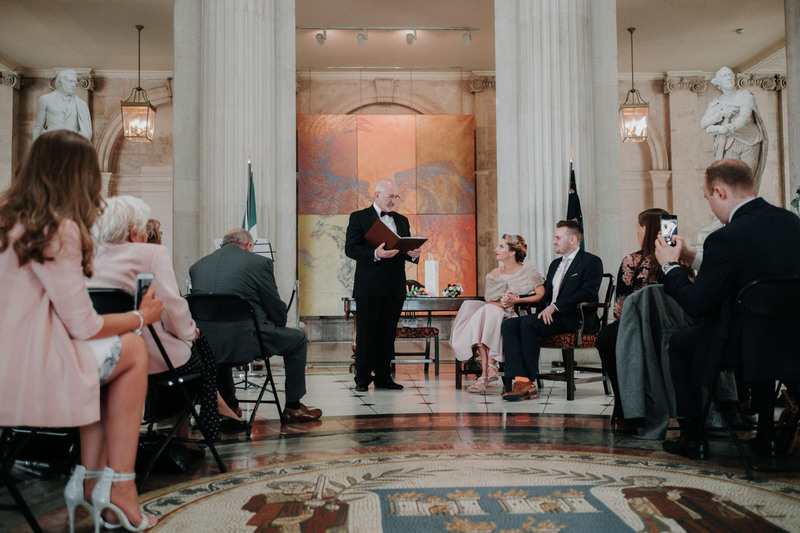 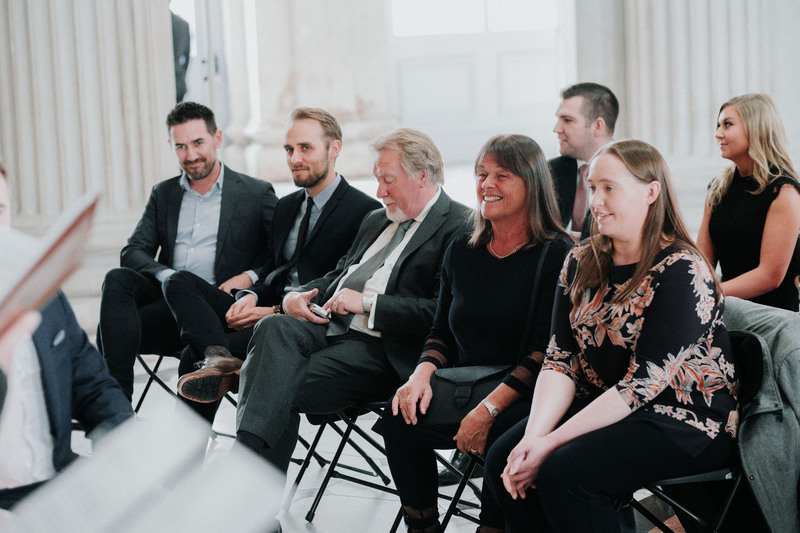 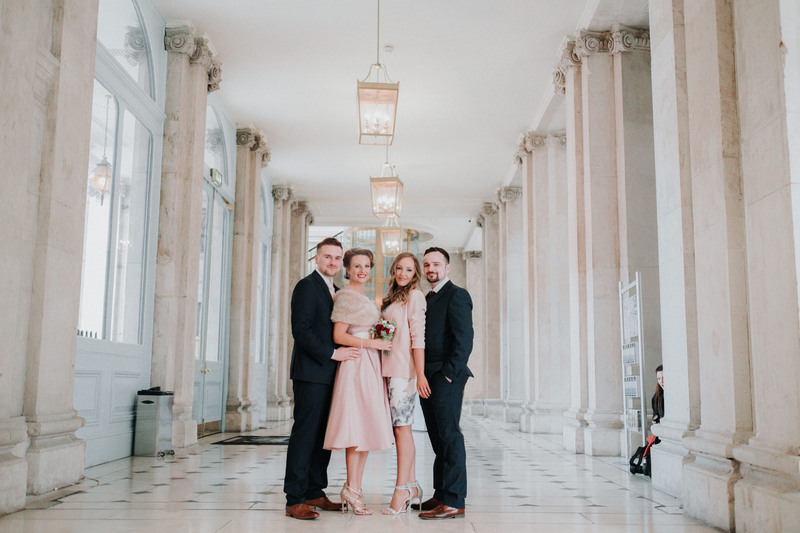 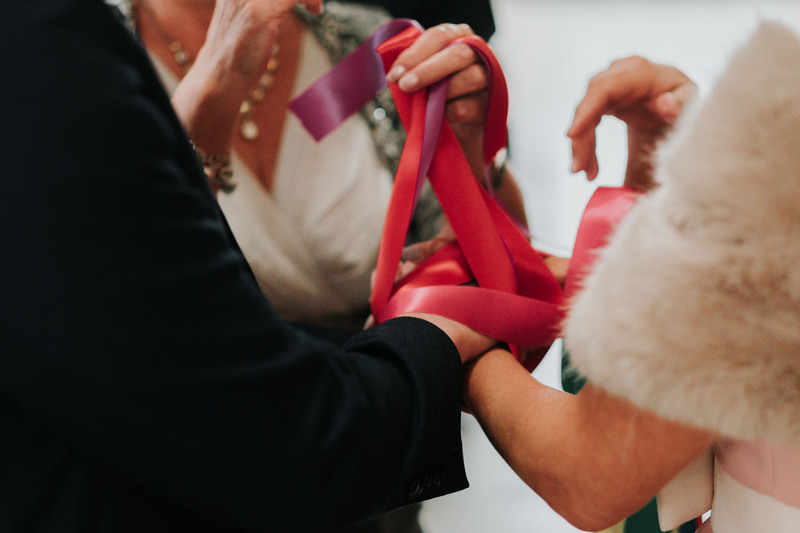 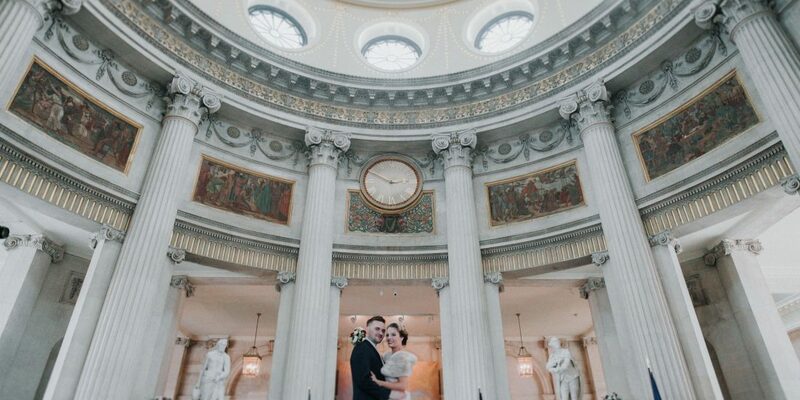 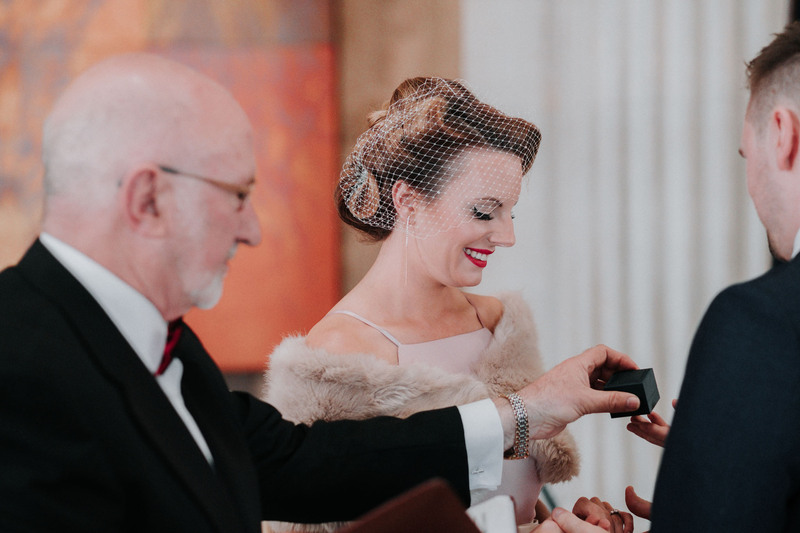 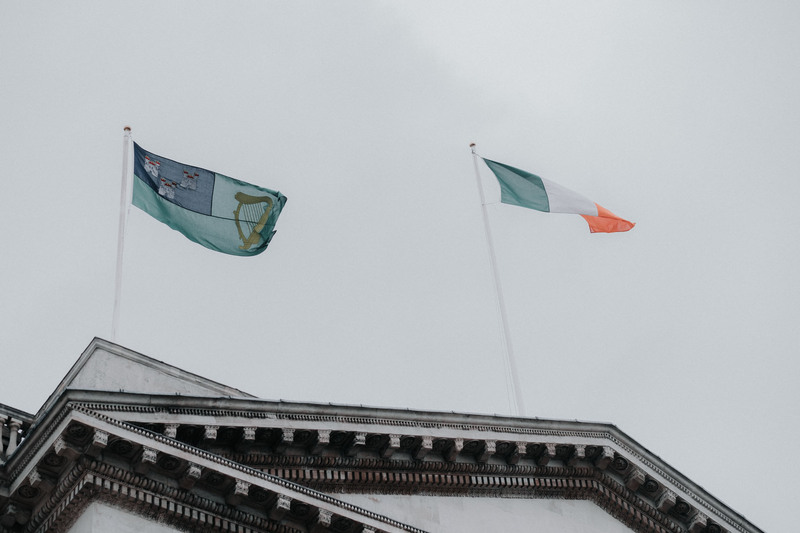 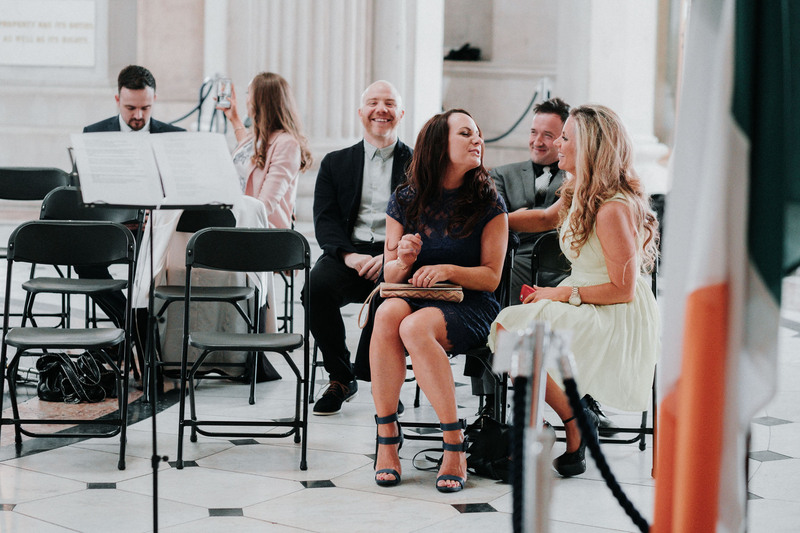 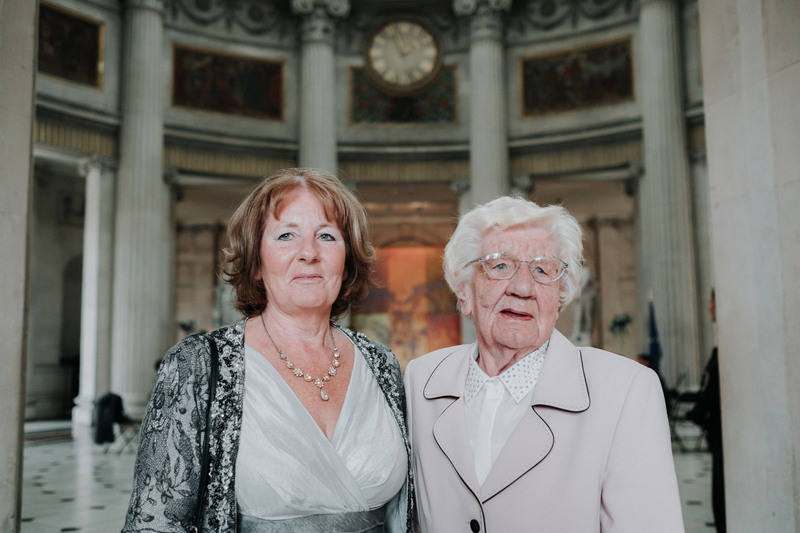 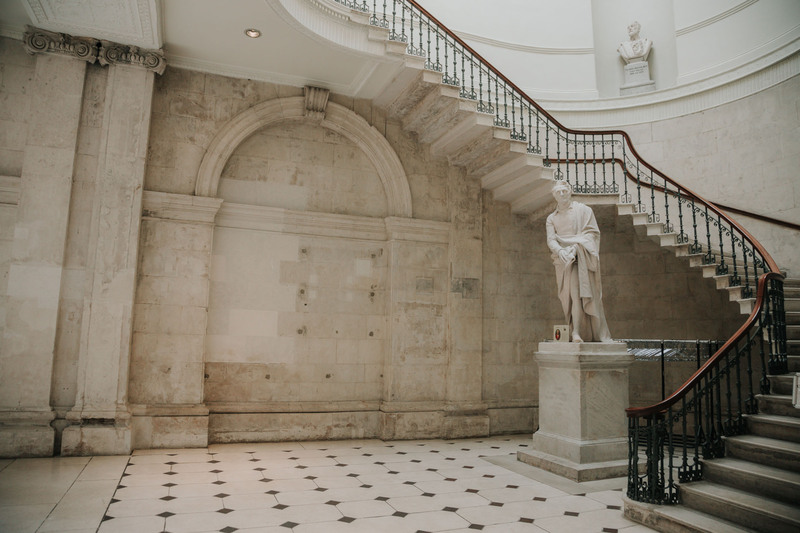 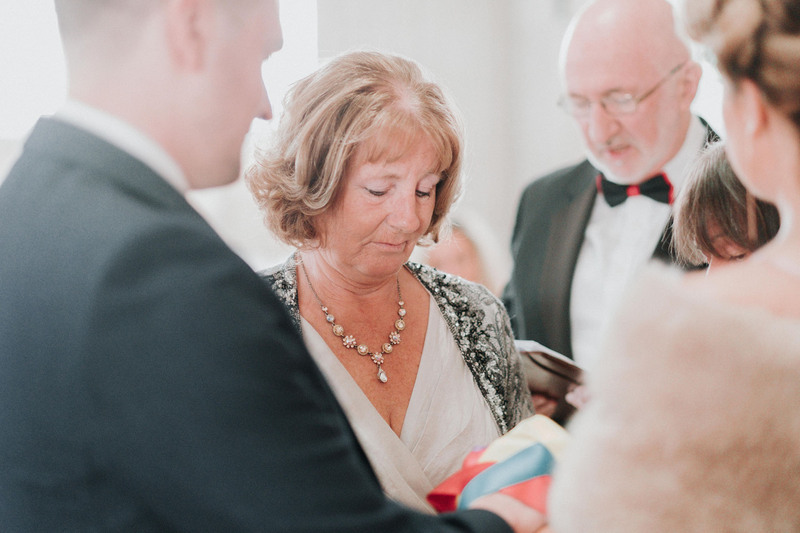 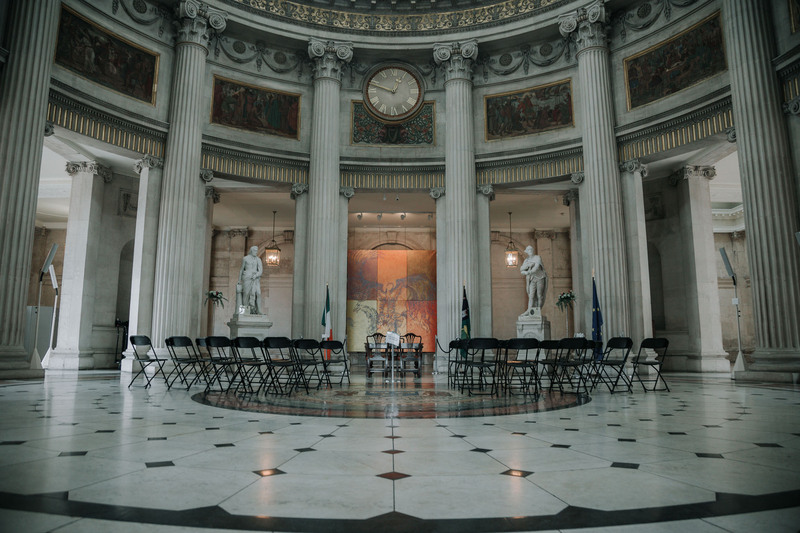 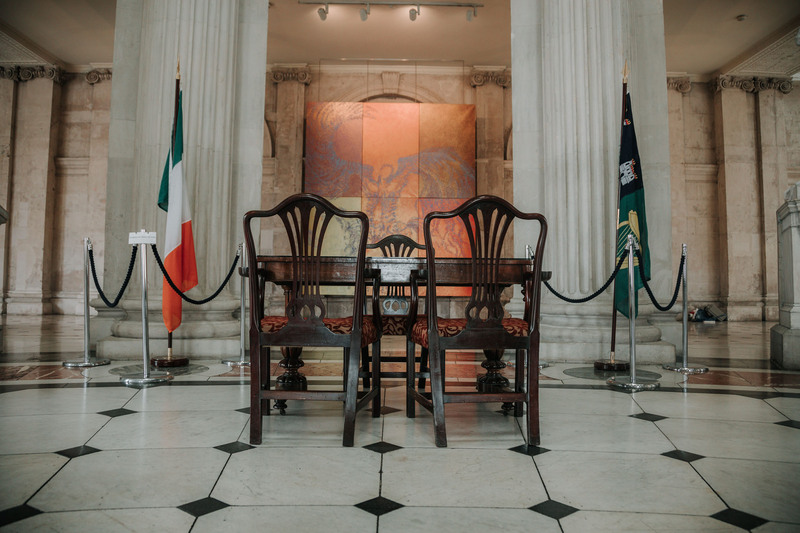 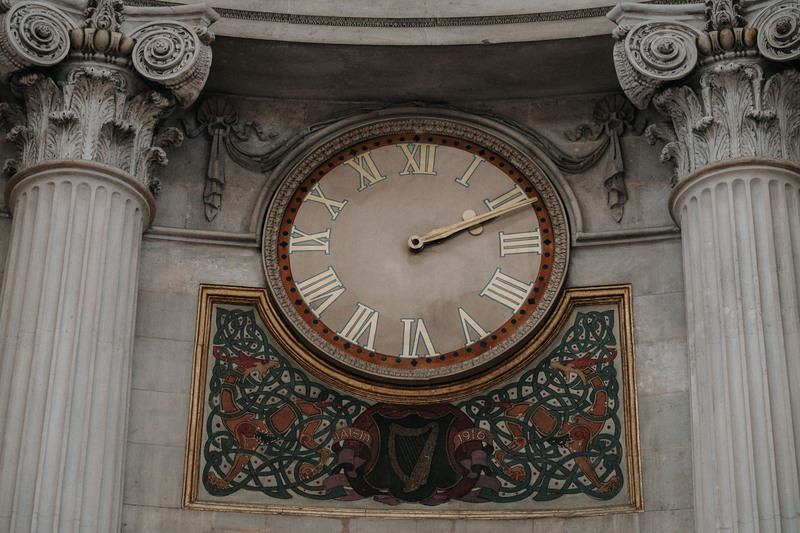 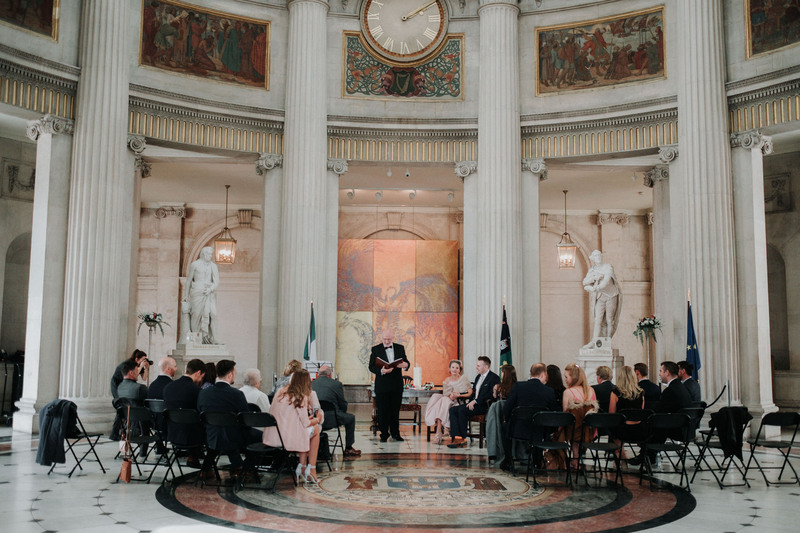 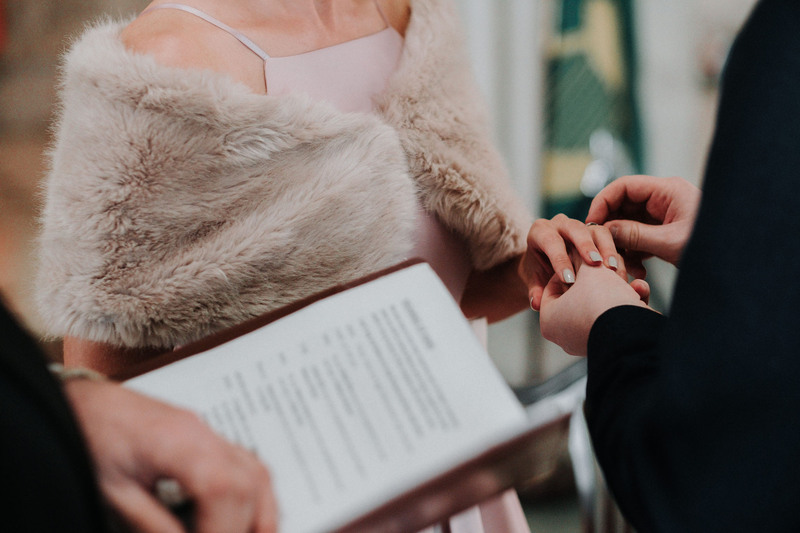 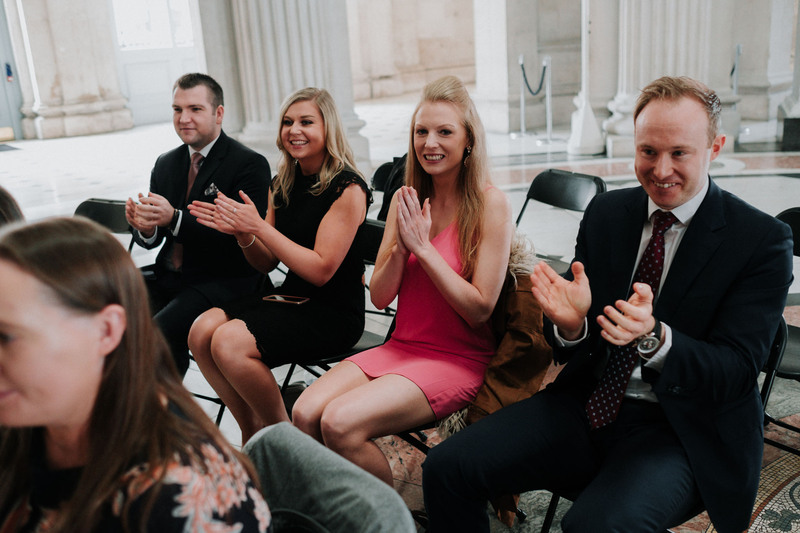 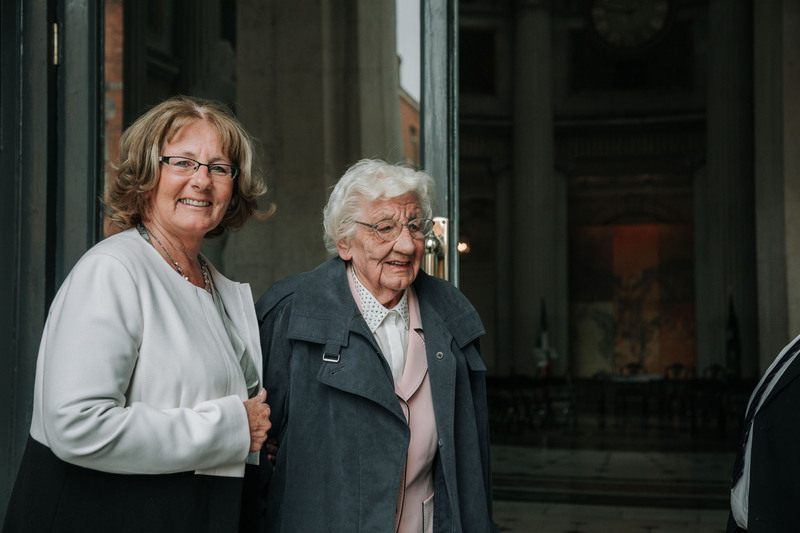 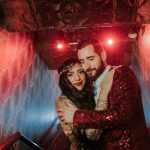 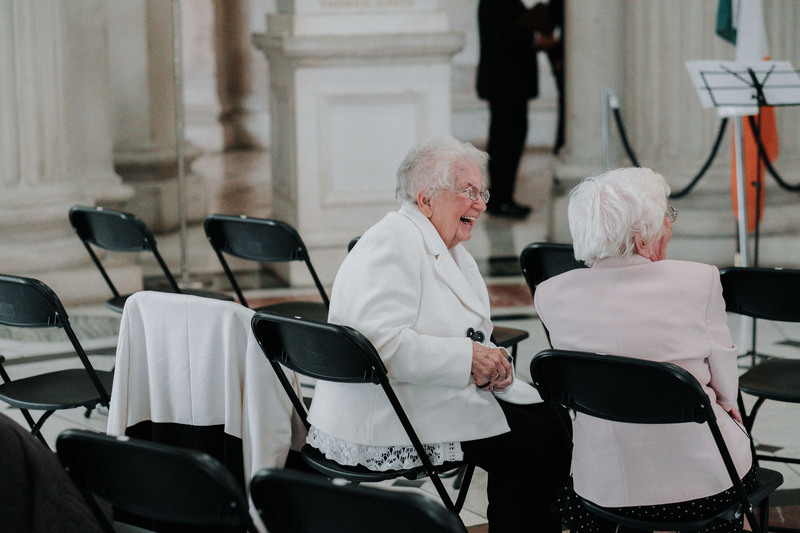 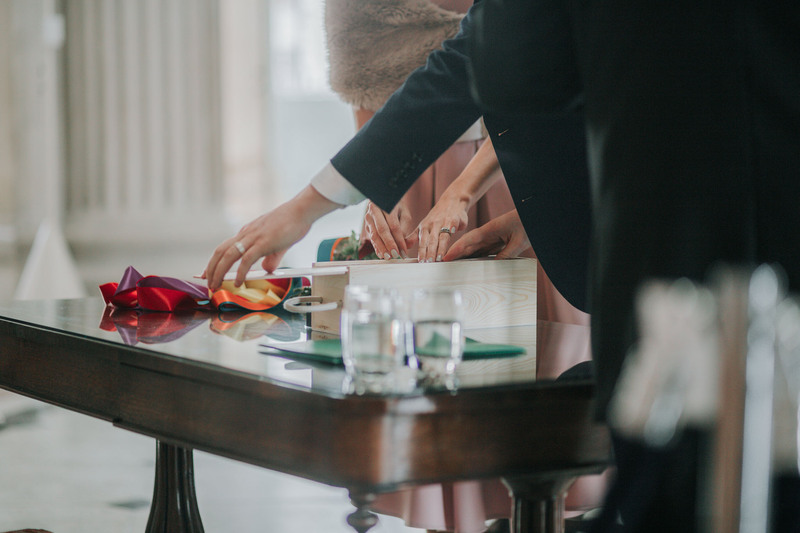 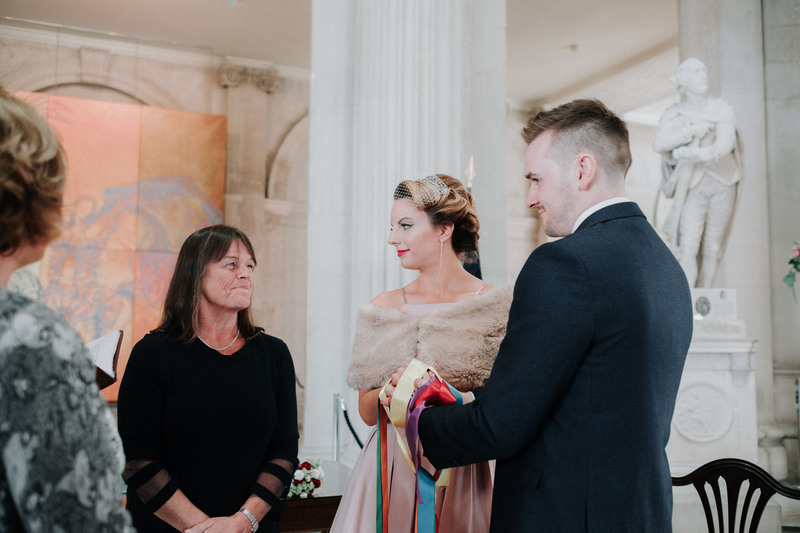 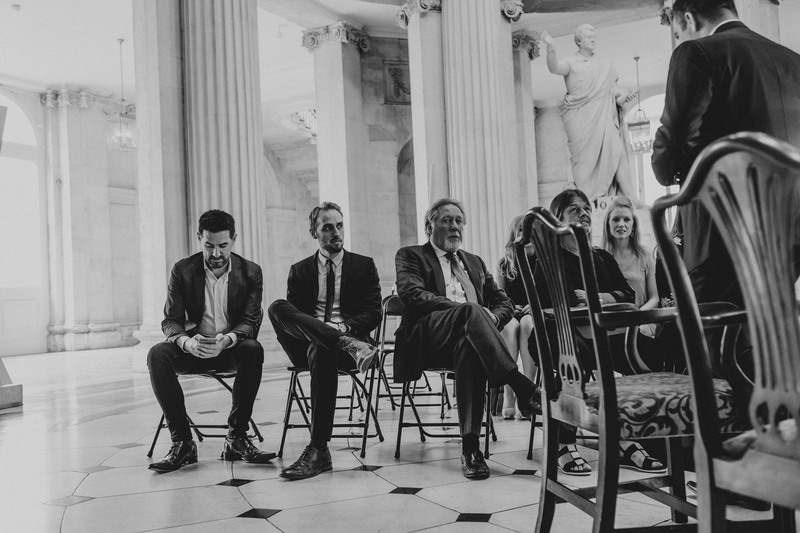 Along with their vows, and underneath Dublin City Hall’s large ticking clock, the couple also partook in a traditional Celtic hand-fasting ceremony, a wedding tradition that dates all the way back to 7000 B.C. 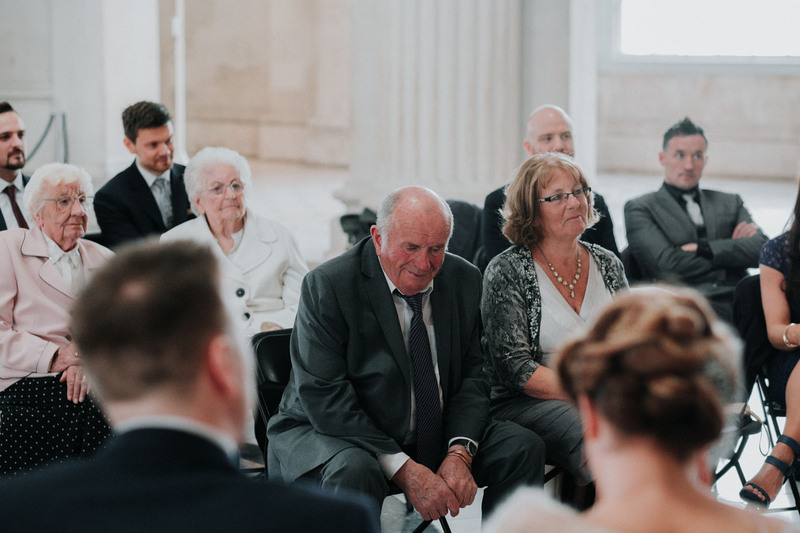 The ceremony wrapped up to the applause of their many wedding guests, and a sweet gestured Rebecca even wiped away a few of Craig’s happy tears. 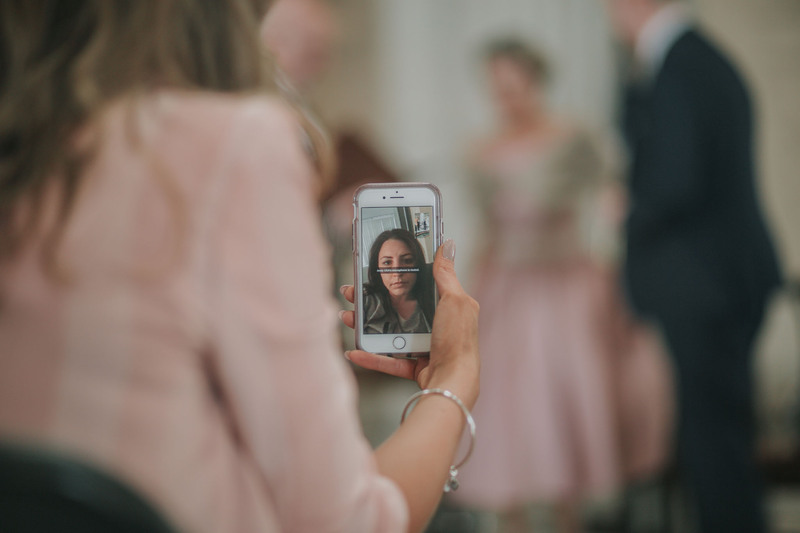 It’s was also great to see technology being put into full swing. 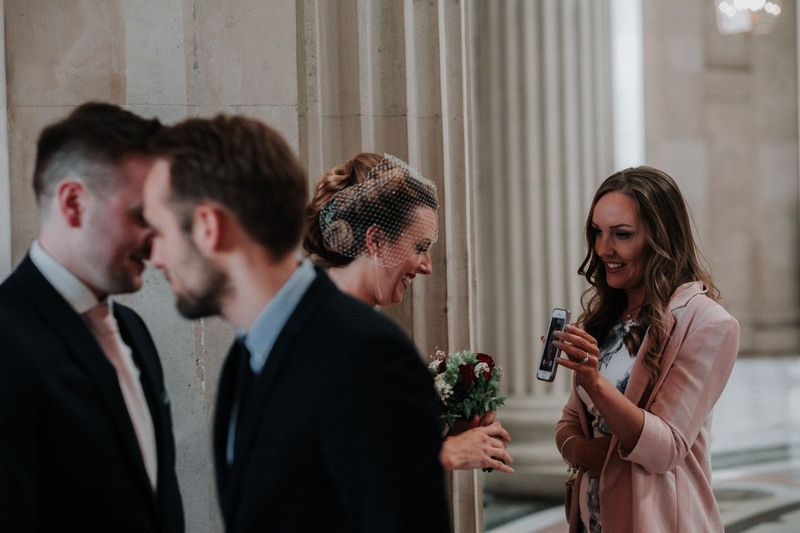 A few of Rebecca and Craig’s wedding guests watched the ceremony via Skype and awaited their time to wish congratulations to the newlyweds, during the receiving line. 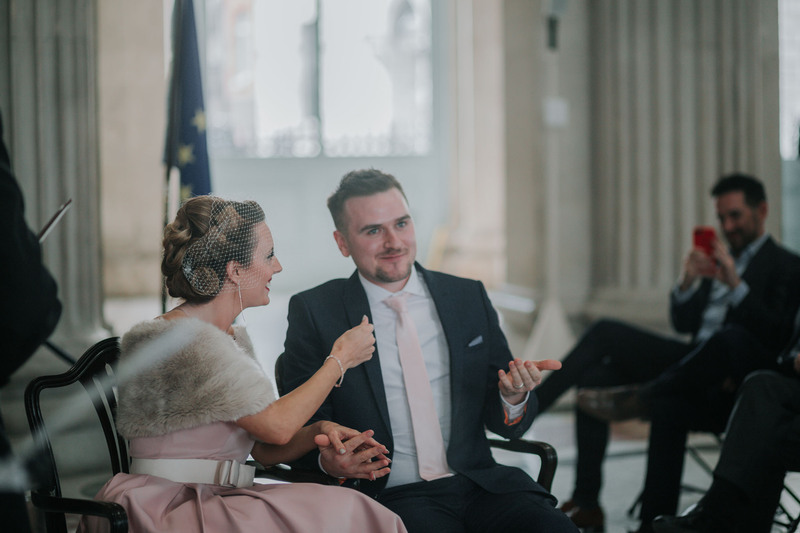 Congratulations again to Rebecca & Craig, and stay tuned for our next blog post, when this wedding arrives in Spain for a party!